This page first went up 11 July 2006. 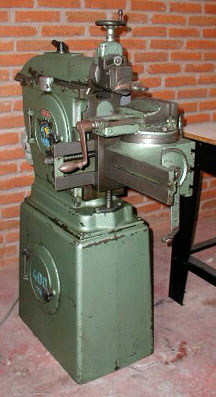 Shapers are a machine tool that is generally obsolete in modern industry, but it still has a place in many home shops or small machine shops. 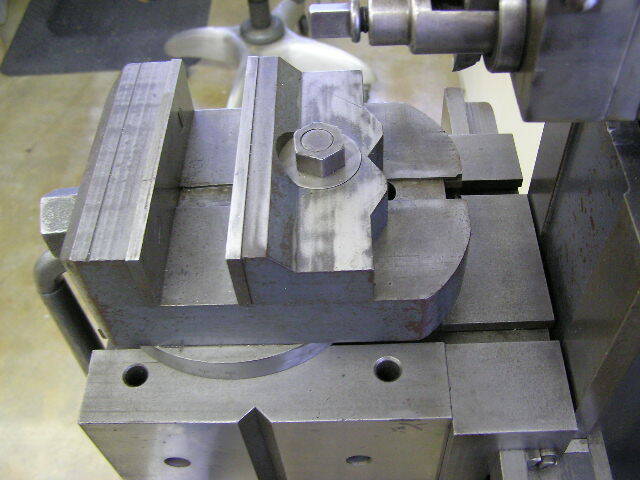 Some people will say that "you can make anything except money" with a shaper. 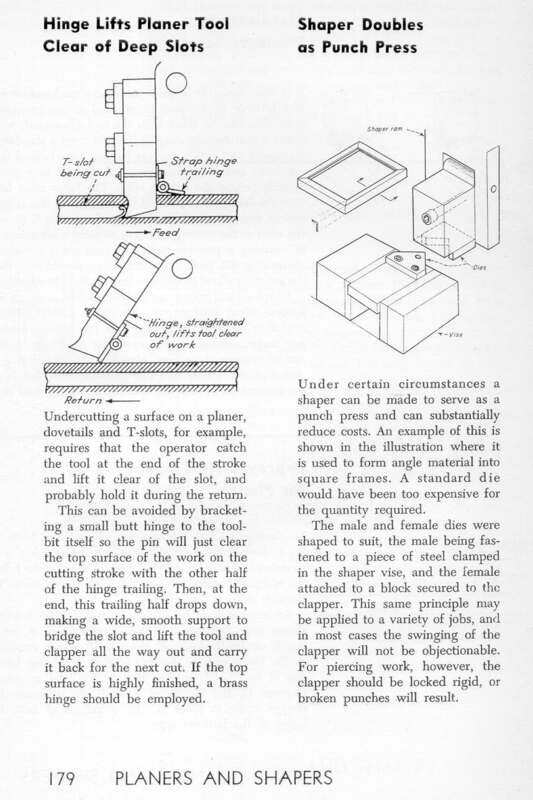 But if that person has a shaper in their commercial shop they'll often then go on to say "but every year one or two jobs will come up that the shaper is perfect for and I'm not scrapping it anytime soon". 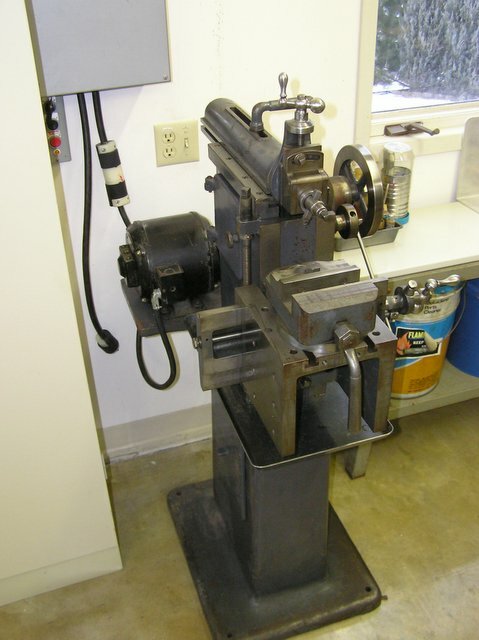 A shaper has a reciprocating ram that uses a single-point tool bit that looks very much like those used on a lathe. 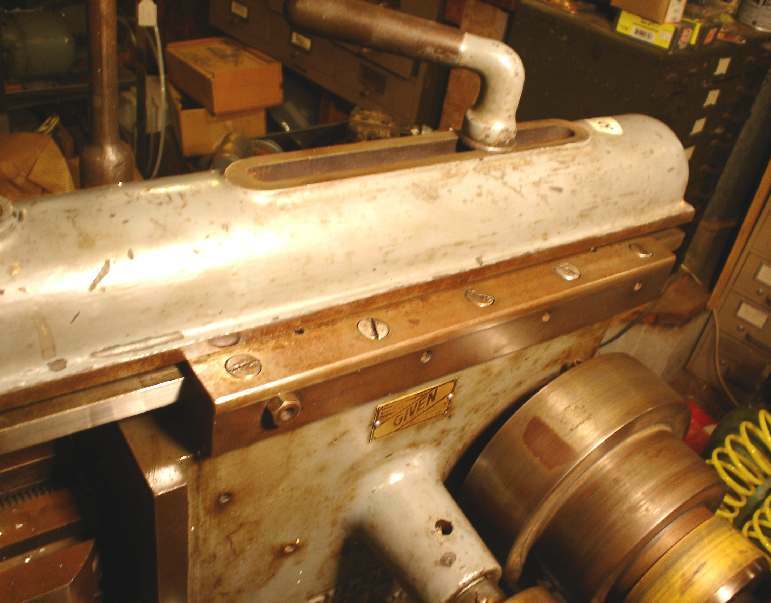 Most use a gear and connecting rod to convert rotary motion into reciprocating motion, but some of the later industrial shapers actuated the ram hydraulically. I've seen mention of 50 or so gallons of hydraulic fluid being needed for those! 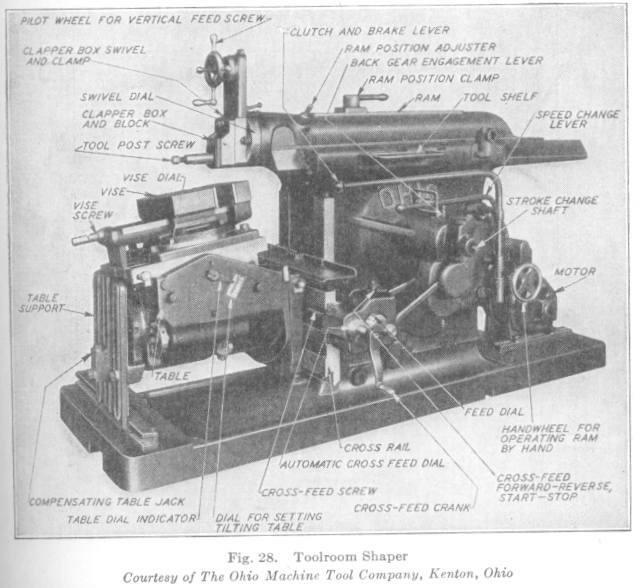 Here's a photo of an Ohio shaper with the parts labeled. 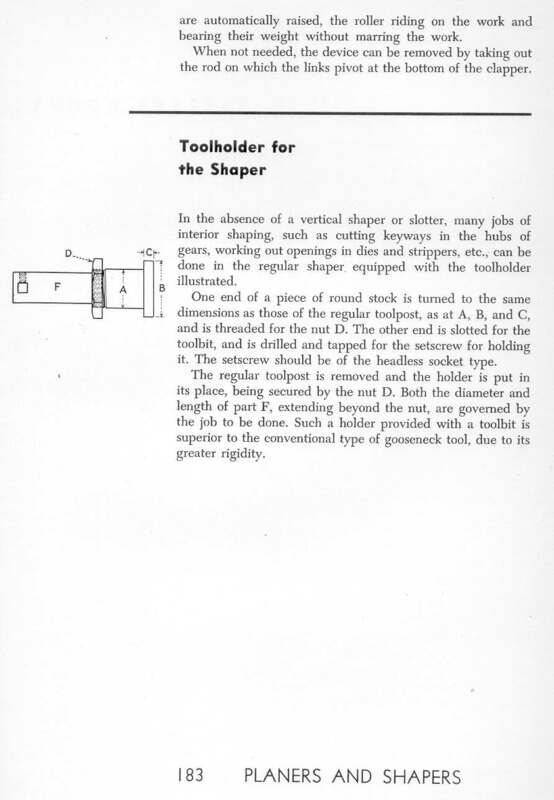 Shapers are very "mechanical" and interesting to watch. One running at a slow speed can have a mesmerizing effect, much like listening to a metronome. But Beware! 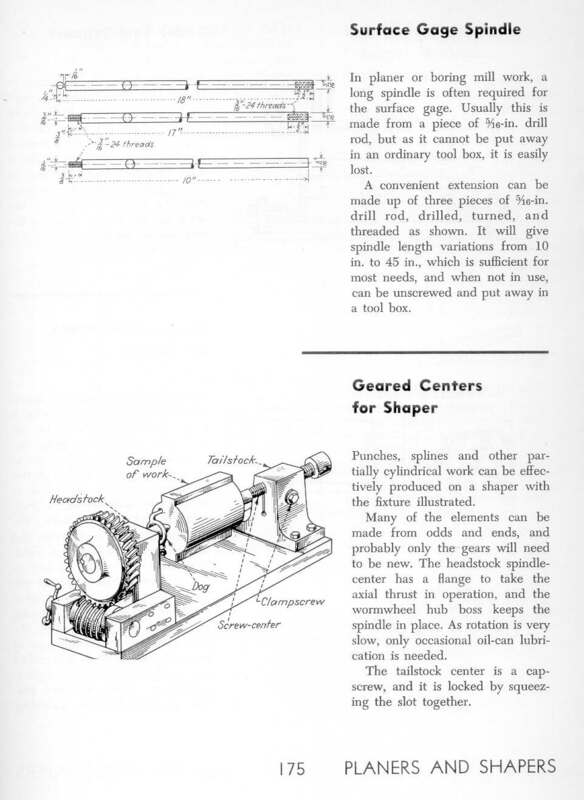 even the smallest and slowest-moving shaper has quite a lot of power, more than enough to do serious damage to the unwary person who gets tangled up with one while it is operating. 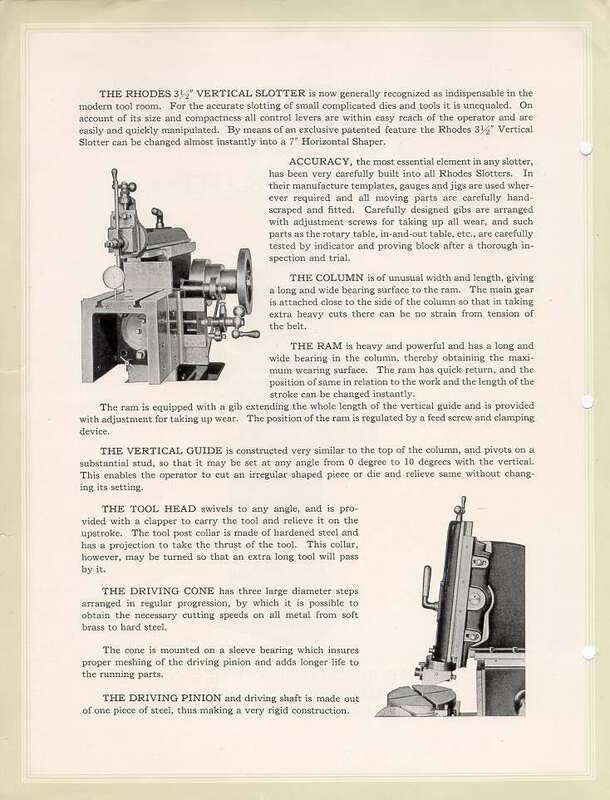 As with lathes, mills and other machinery safety should always be a primary concern. 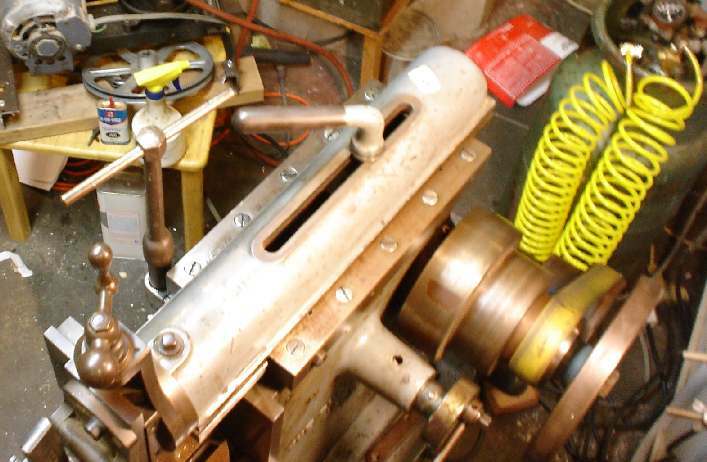 In early July 2006 I became a shaper owner. 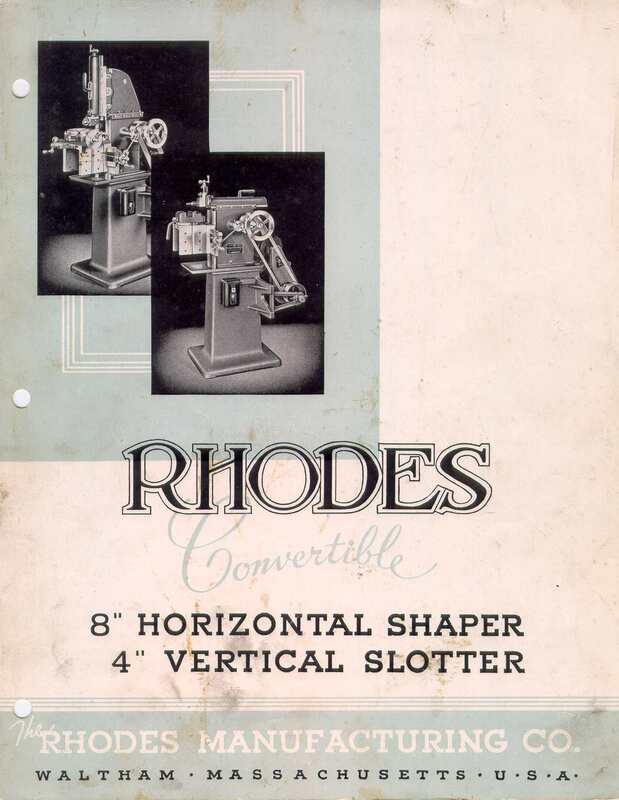 Jon Spear, one of the Practical Machinist forum members who lives in my area had found an 7" Rhodes shaper, serial number 1421 (which was probably manufactured in the early 1920s) late in 2005. 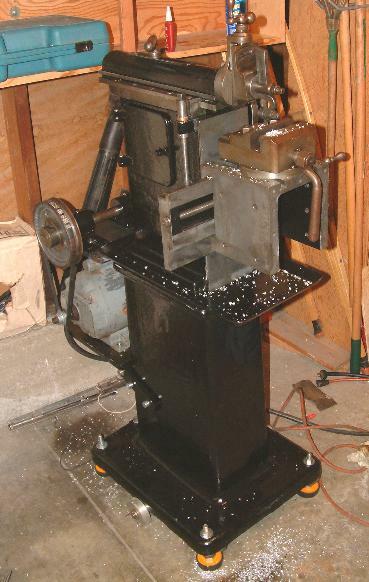 I'd visited Jon several times and I told him that if he ever decided that the shaper needed a new home I'd appreciate having first crack at it. 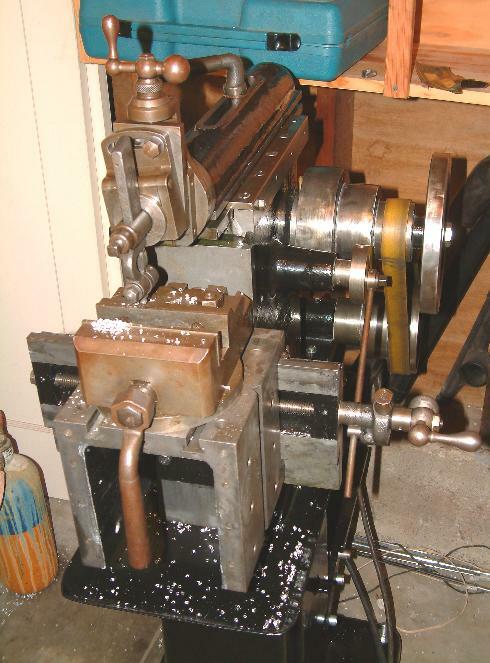 In June 2006 Jon decided that he could use the space the shaper was occupying more than he could the shaper, and shortly thereafter the shaper became mine. 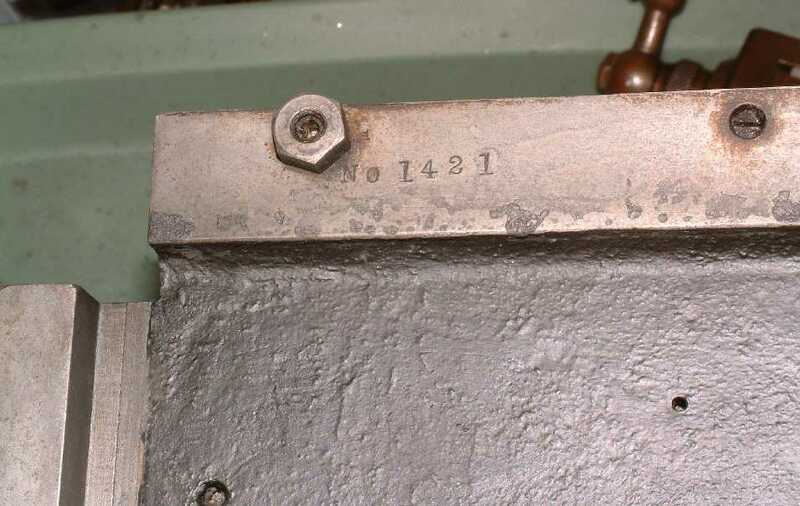 The serial number on my Rhodes shaper Note the small "1" that appears above it next to the nut. 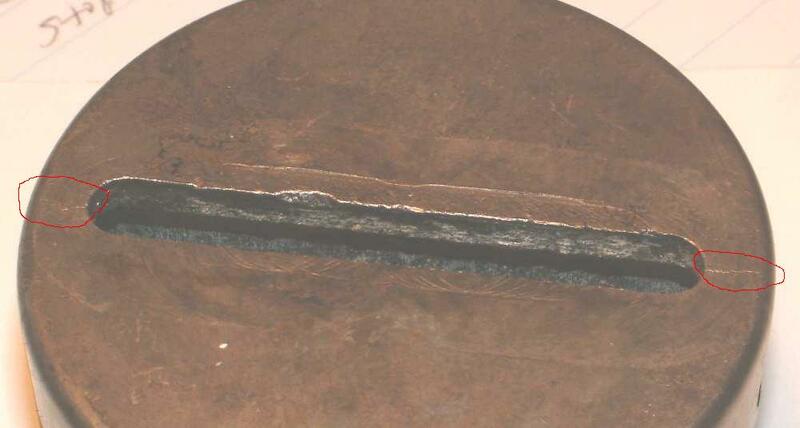 The cracked feed eccentric on my shaper I suspect that it is easy to drive the taper pin in too hard and cause this crack, which occurred on the larger of the two tapered holes. 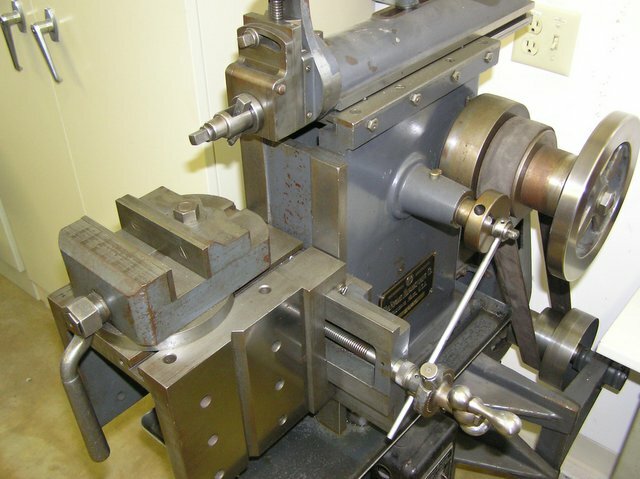 Somewhere between my machine and Rick Montague's #2095 machine the taper pin was deleted and the shaft being held on just by an interference fit. 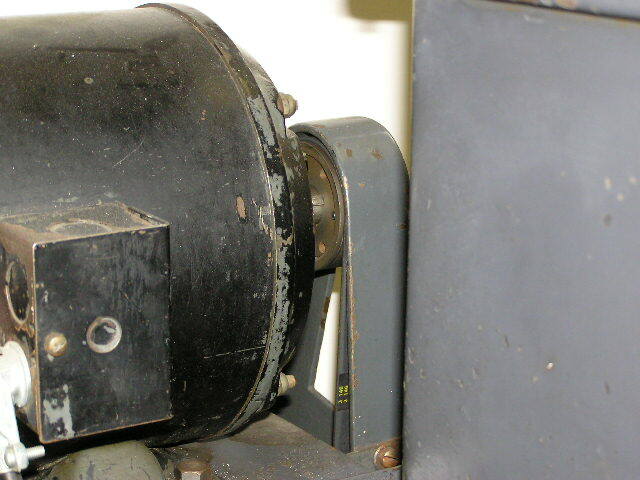 (Later) I was looking at the eccentric again while making a new one, and noticed more cracks at the end of the adjustment slot. 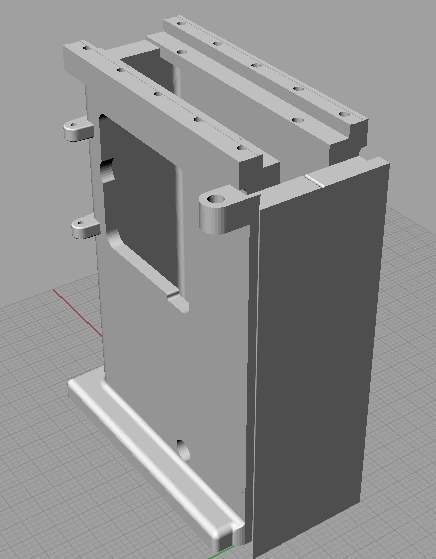 I'm making the new part out of 4140 (not in the pre-hardened condition) and I'm wondering if it might not be a good idea to also thicken the large flange to add a little more meat on the outside of the adjusting slot. 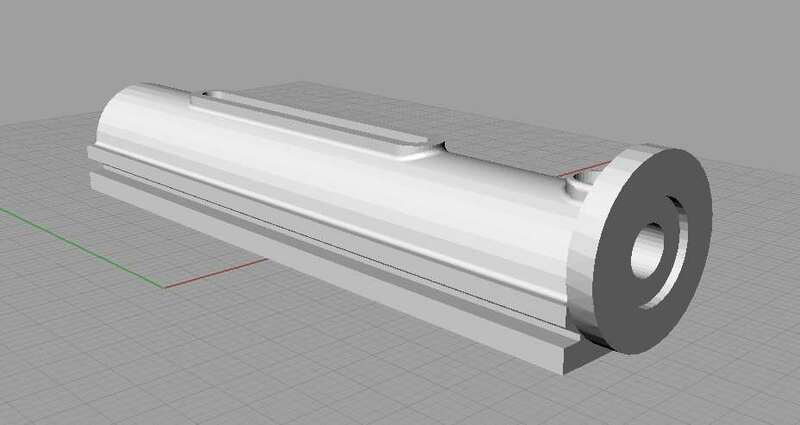 I already plan to eliminate the taper pin to the shaft and count on an interference fit to do the job as on the later shapers. 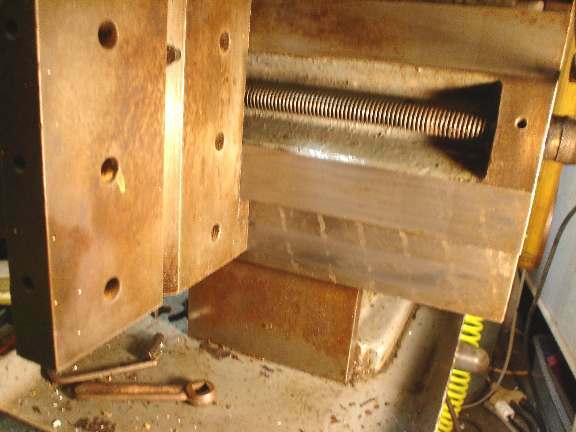 However, extra thickness may not be needed if I make a point of not getting overly hamfisted when tightening up the clamp bolt on the eccentric. 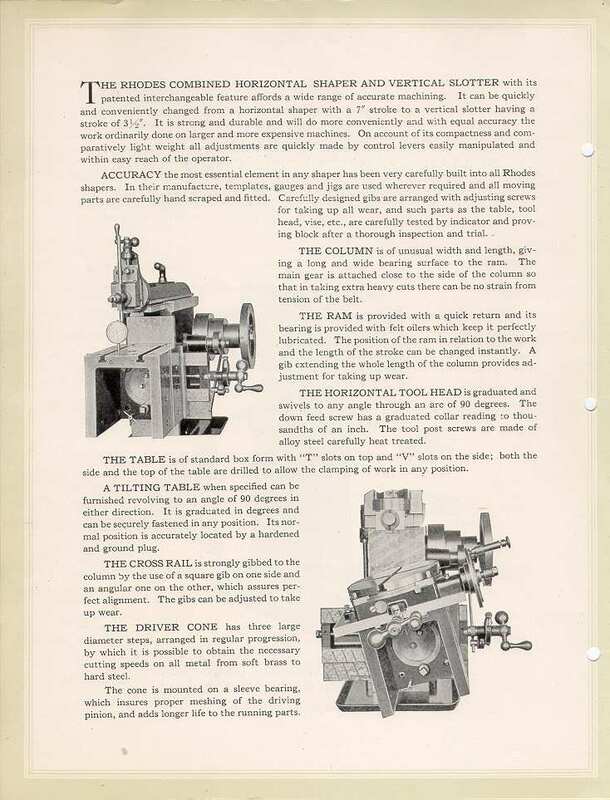 The eccentric would not seem to be a very heavily loaded part. Here are some photos of the shaper after I painted it. I decided to not go wild cleaning all the bare metal down to "bright" as it would just tend to get rusty as it lives near the ocean. 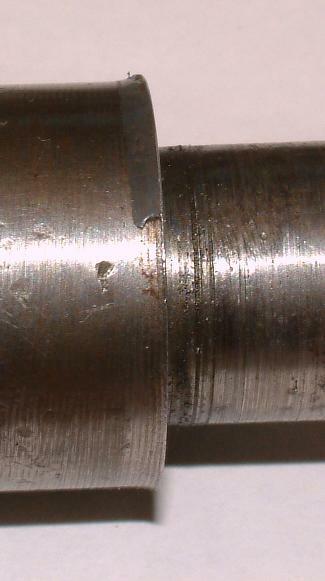 Mushroomed Z axis screw Here you can see how the bottom of the shoulder on the Z-axis lead screw was flaring out. 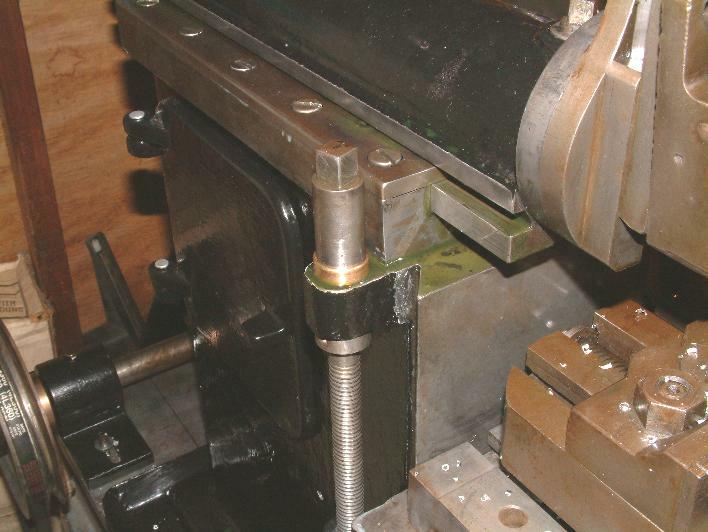 Modification to the Z axis screw To correct the problem I made this 660 bronze cup. 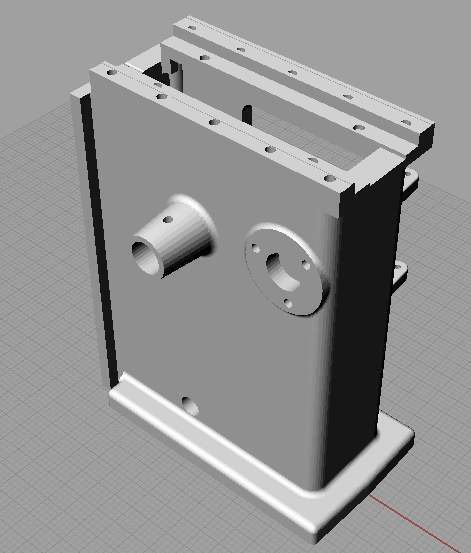 I shortened the mangled part of the lead screw, pressed on the cup, and faced the assembly to size. 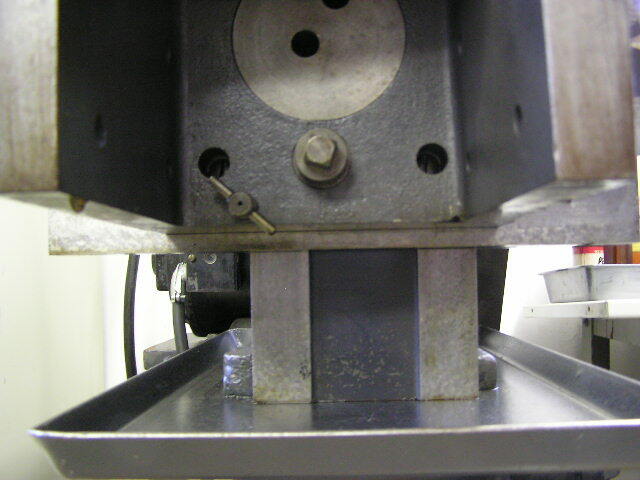 I glued a flat needle-roller thrust bearing race to the shaper and then shortened the bronze cup to give just the right amount of axial clearance to bring things back to minimal axial play in the assembly (there is a retaining collar that is pinned to the screw on the underside of the boss on the shaper). 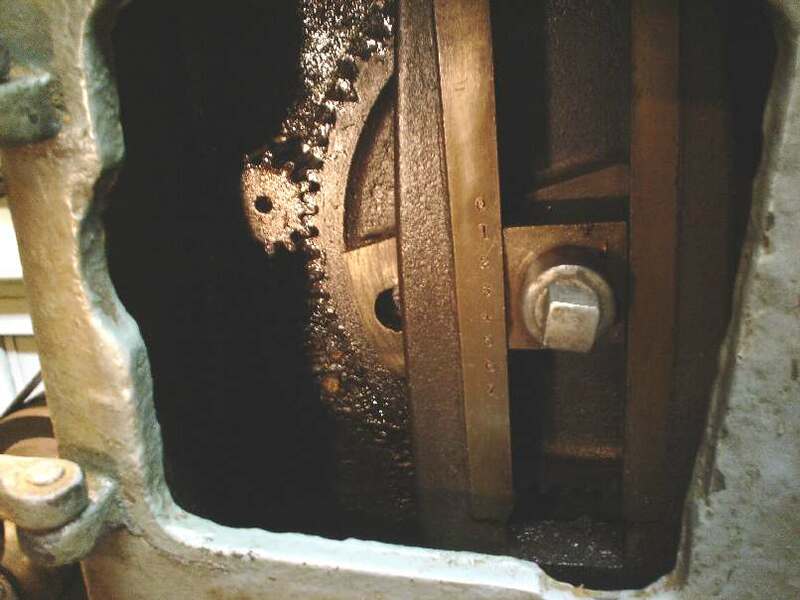 This gives an increased bearing area, and all wear takes place between the bearing bronze and the hardened race, and not between the screw and the shaper casting. 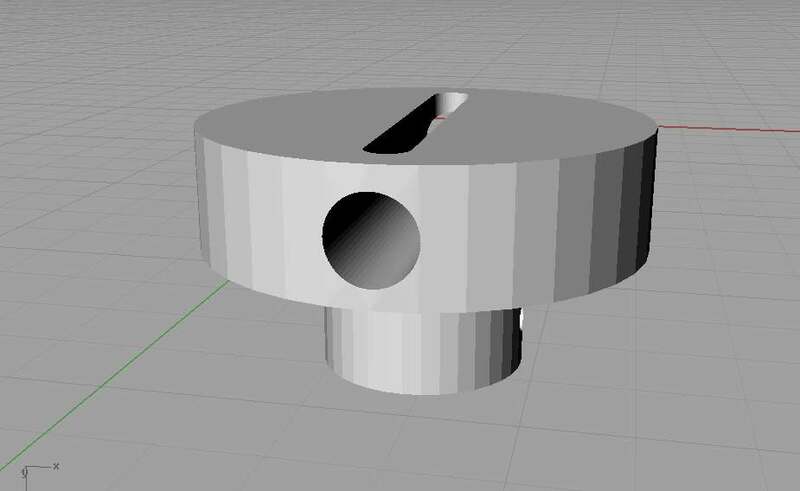 Close-up of the table/ram The new table feed eccentric I made is installed with an interference fit, as on the later models, instead of a cross-fitted taper pin. 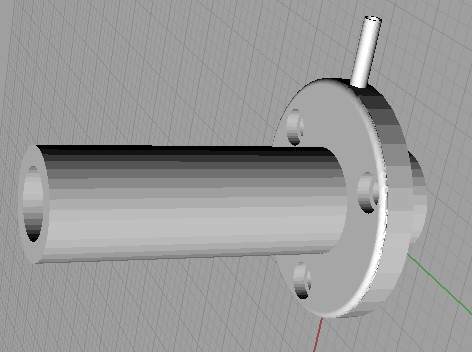 I drilled a 1/4" hole through the slot into the shaft bore to allow me to use a three-jaw puller to remove the eccentric, should that become necessary. Wheels and isolation mounts I don't need to the machine to be very mobile, but I do want to be able to park it parallel to a wall when not in use, and then rotate it perpendicular so I can get to both sides of the machine when I want to use it. 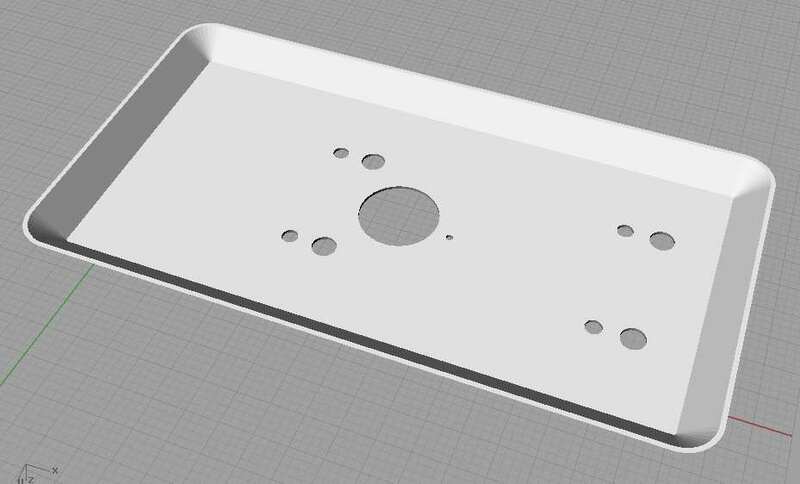 I had some 3/8" flat bar, and I welded a stub axle onto each of two strips that run front to back and made a couple of aluminum wheels to run on the axles. 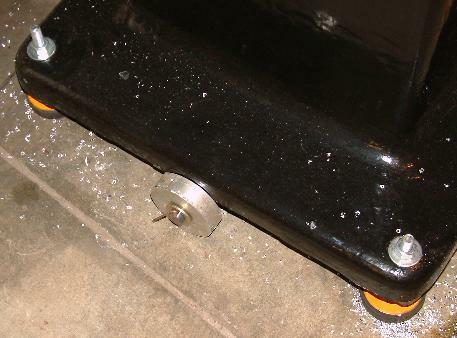 That bit of welding rod is there temporarily until I can find where my box of cotter pins is hiding. 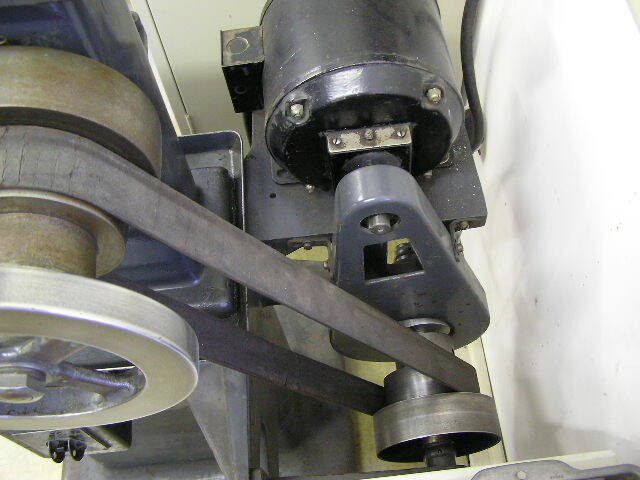 When I want to use it I can retract the isolation mounts and then pivot the machine, jacking it back off the wheels with the mounts when it is position. 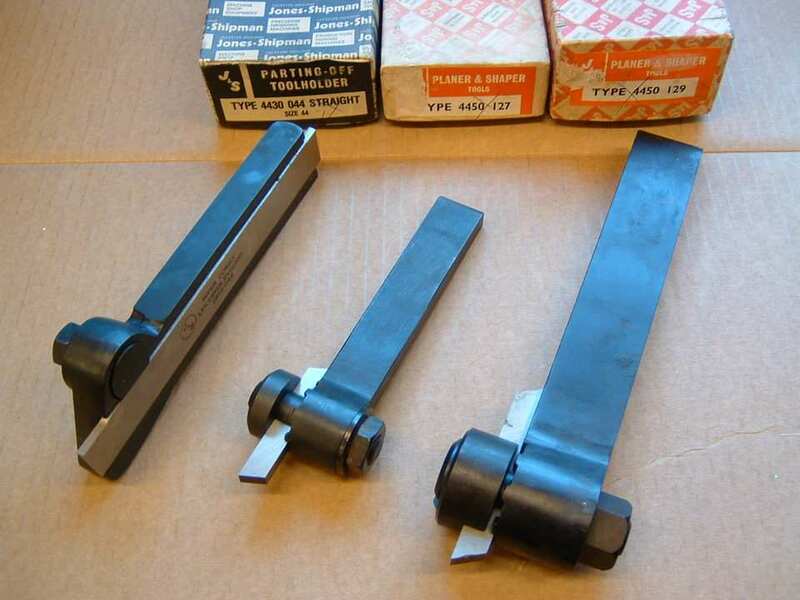 Below is a list of serial numbers by year that Art Volz on the Yahoo Shaper group posted a while back. 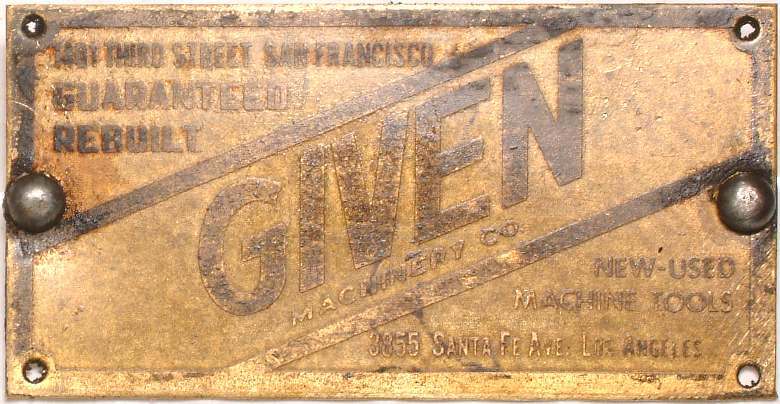 They only go as far back as 1929, and appear to begin when Ames took over production in Michigan. Art says the numbers are as of the end of the model year. 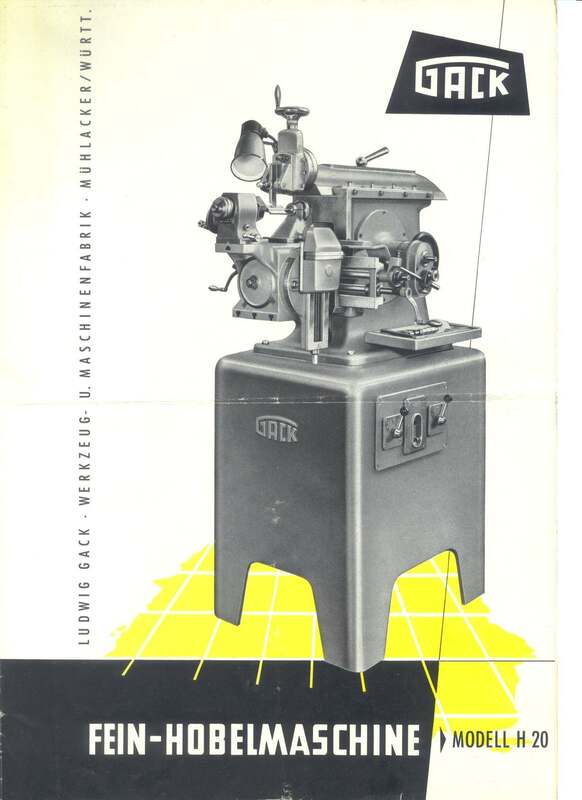 It appears that the amount of machines made each year was not very large. 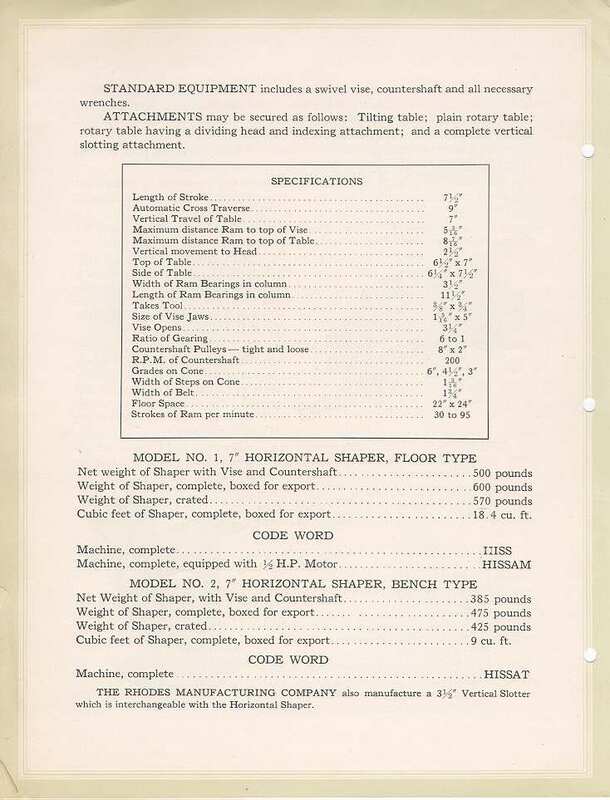 Here is a PDF copy of the Rhode's patent document. 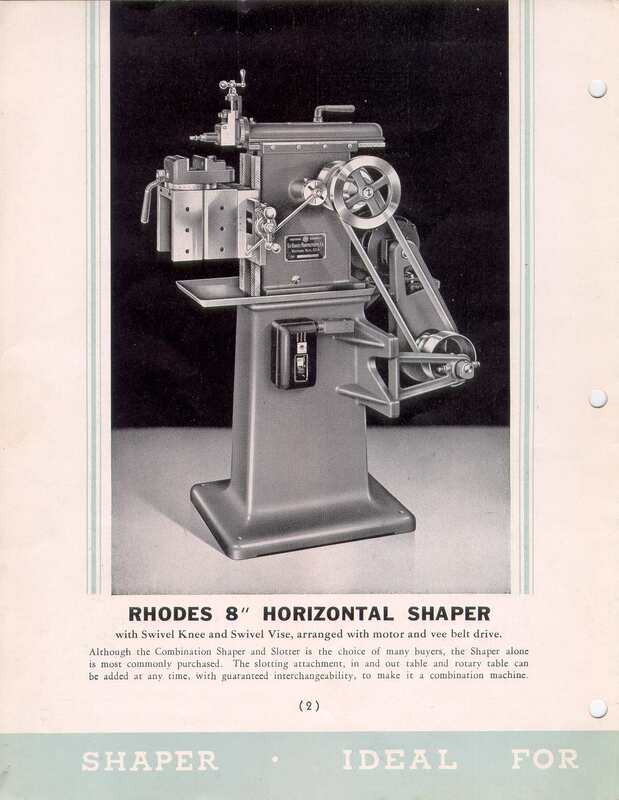 Mike Henry is another person from Practical Machinist who has a Rhodes shaper. 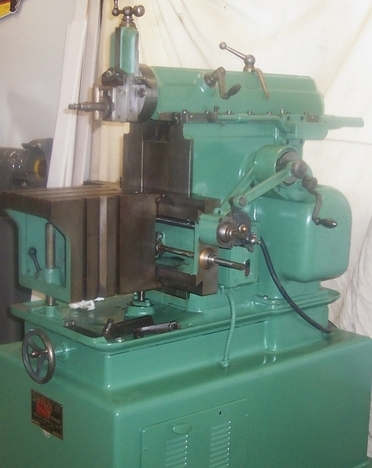 He got lucky and was able to obtain the parts that convert the shaper into a vertical slotting machine. 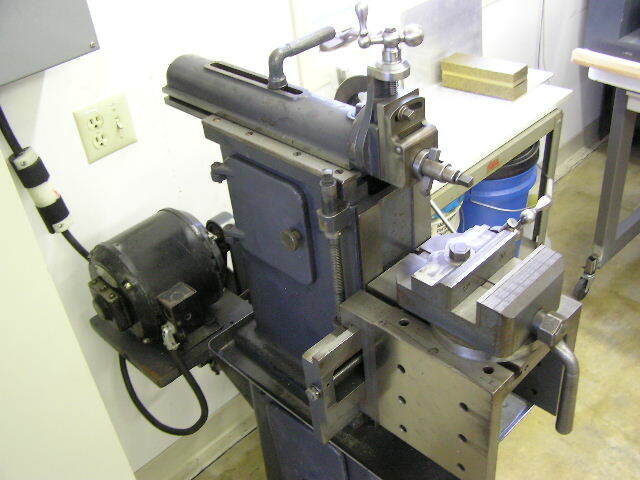 The shaper was sold in either configuration, or you could buy all the bits and quickly swap back and forth as needed. 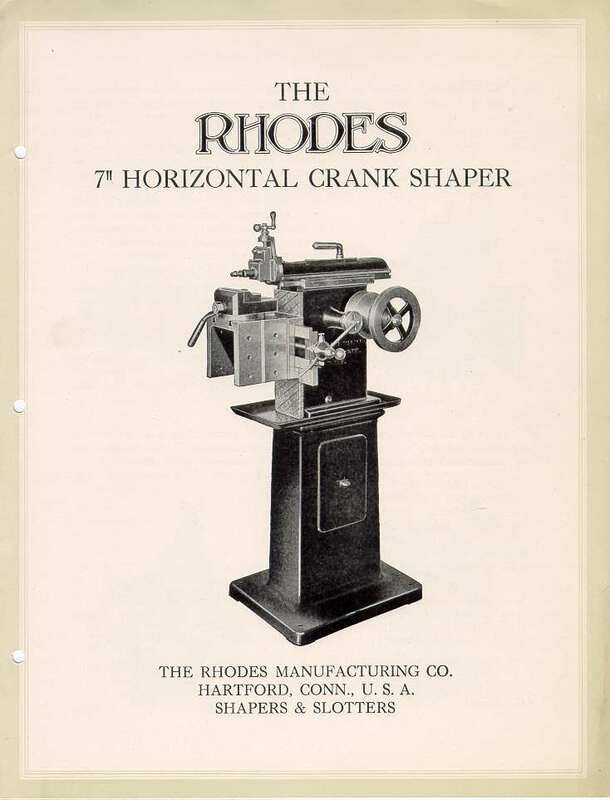 Be sure to check out the Rhodes Shaper pages on Mike's website. 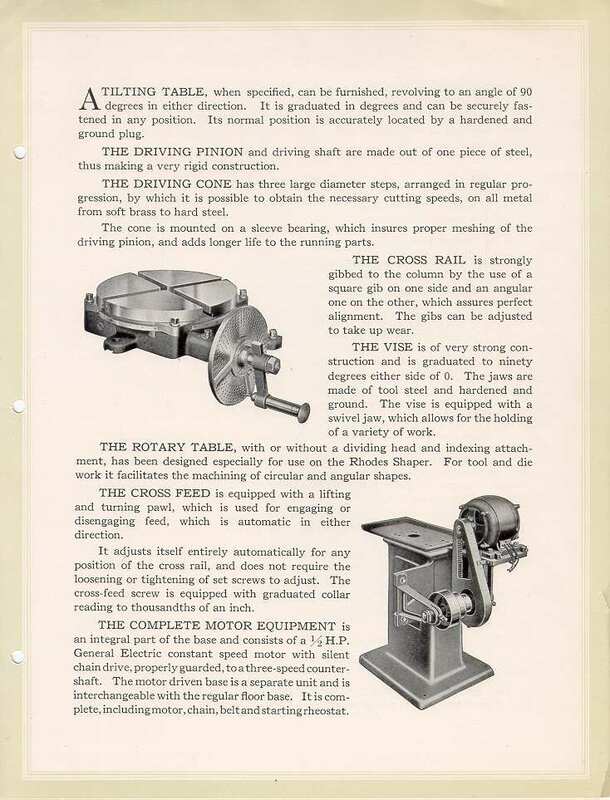 You'll notice that Mike's machine is one that was built to be powered by an electric motor, while the one I have is a line-shaft machine that was converted by someone to electric power. 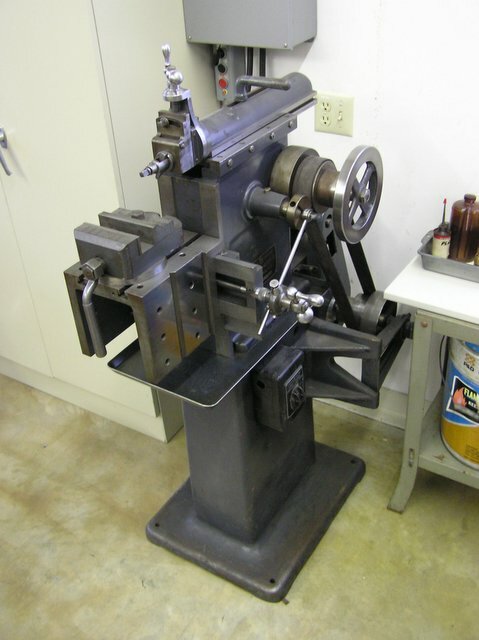 The serial number on his machine is 2413 which he thinks dates it to 1929. I was sent this photo by J.D. 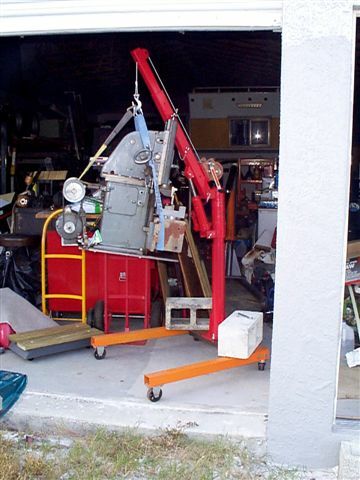 of a Rhodes slotter being hoisted into a van by one of the folks at PM. 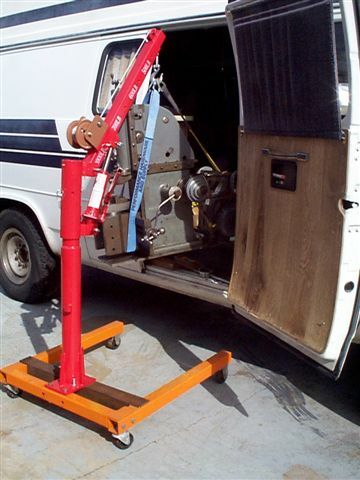 That's a small crane/hoist for a pickup truck mounted on the base of an engine hoist. This photo is the slotter after it was unloaded. 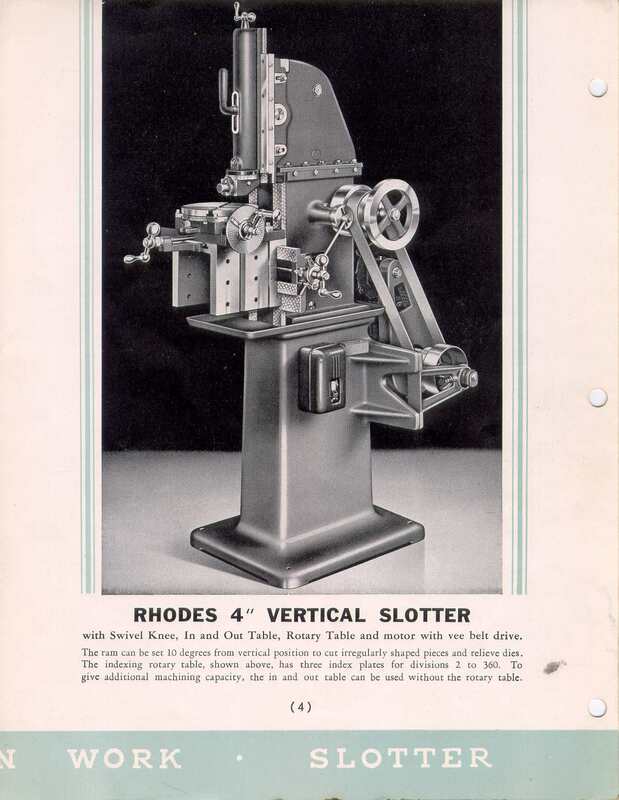 The lathes.co.uk site has several pages of Rhodes information as well as information on a lot of other shapers, lathes and milling machines. 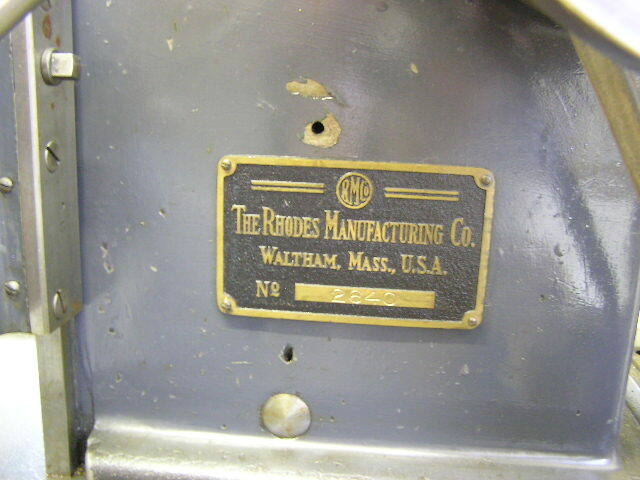 This is a 1939 Rhodes with stock tilting table and original paint. 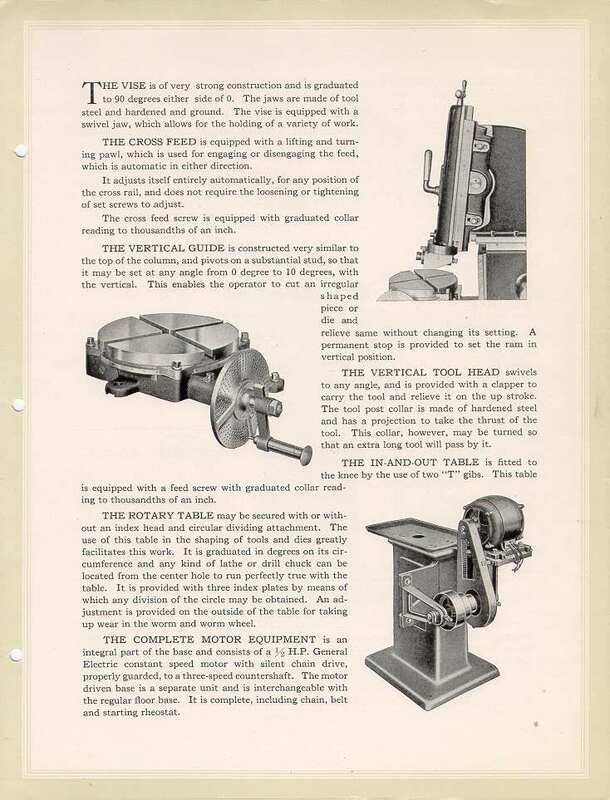 It had a vertical slotting attachment that was accidentally lost by the previous owner. 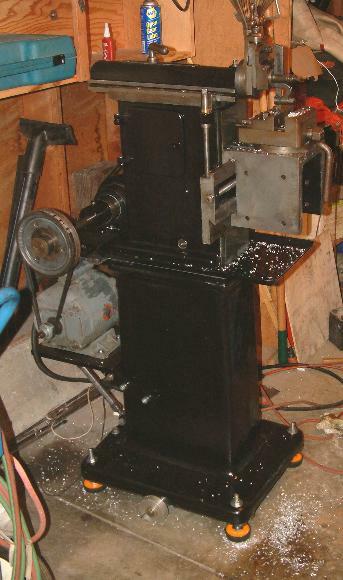 It has a stock 1/2 HP 240V 3 phase motor which now (2005 conversion) runs on a Jaguar VFD. The control is in the box on wall. 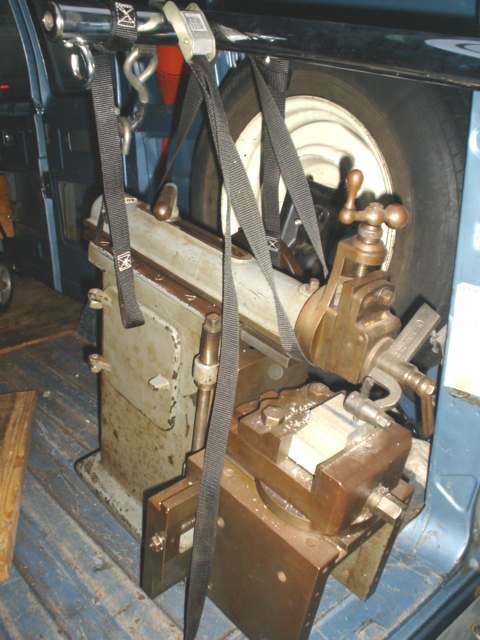 The original primary jackshaft drive used a "silent" chain. 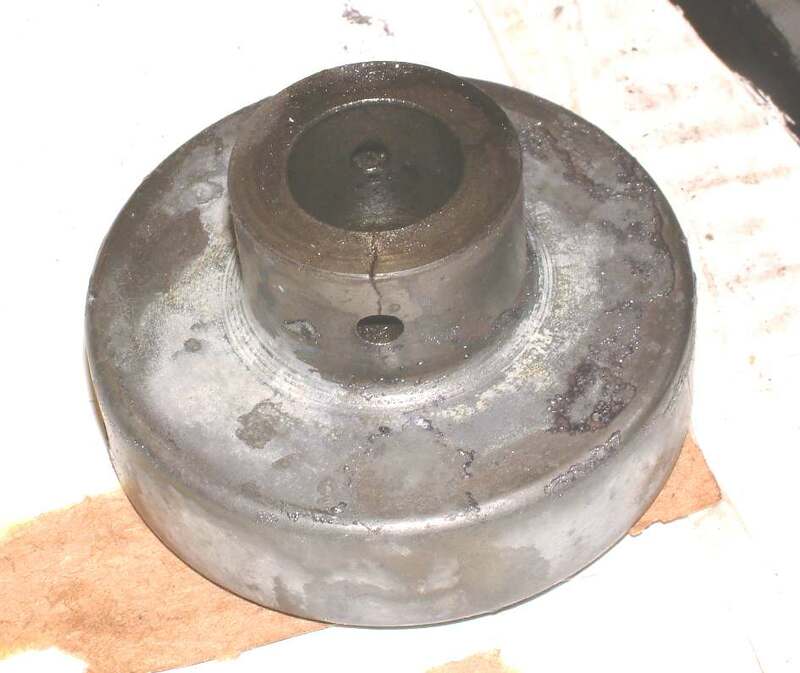 The chain and sprockets were very worn and made a lot of noise, so they were replaced with Poly V belt (1") and shop made taperlock pulleys . 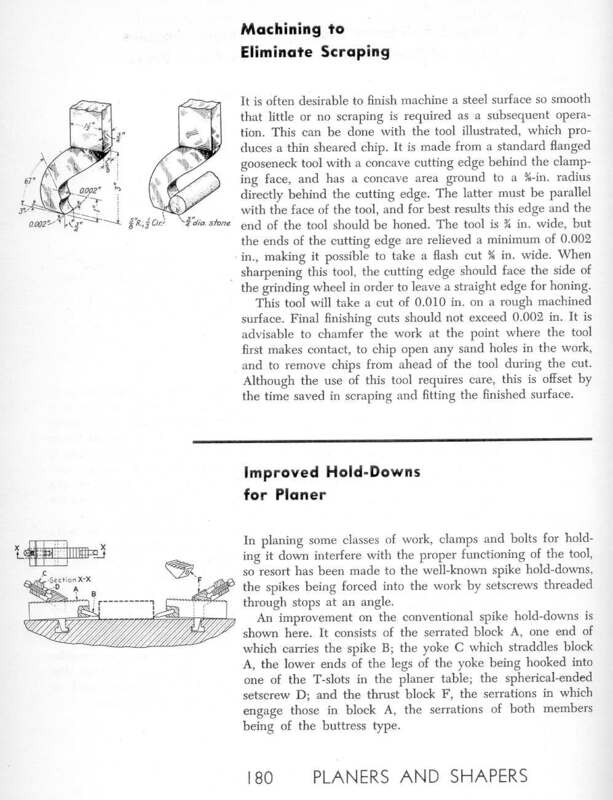 The secondary flat belt drive is very functional and was not revised. 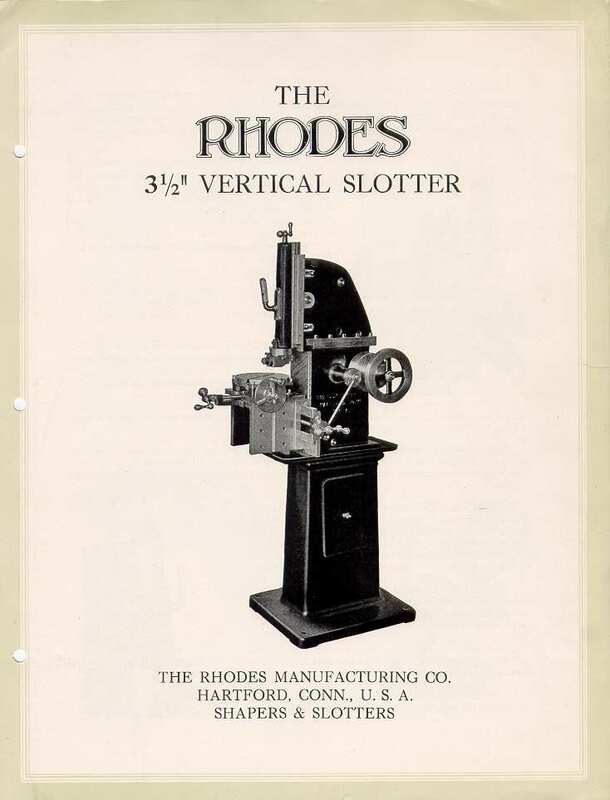 If you are not familiar with Rhodes, then you may not be aware of their vice. 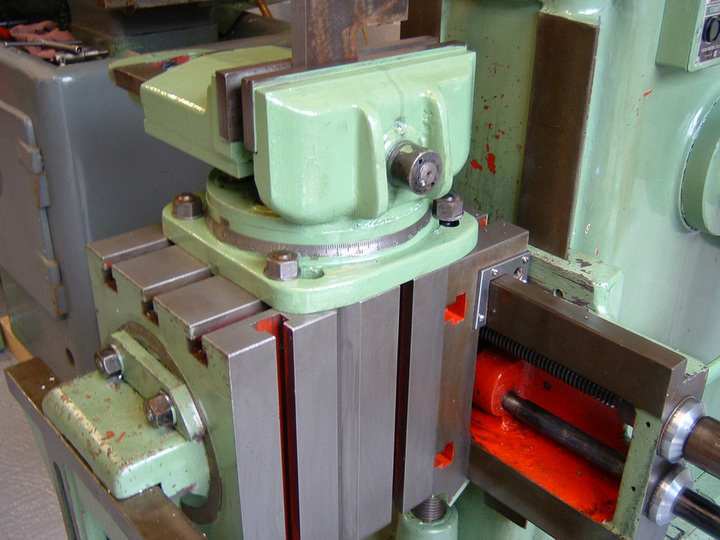 It is capable of full rotation about it's center and the (swiveling ) loose jaw allows rigid clamping of round or odd shape work pieces. 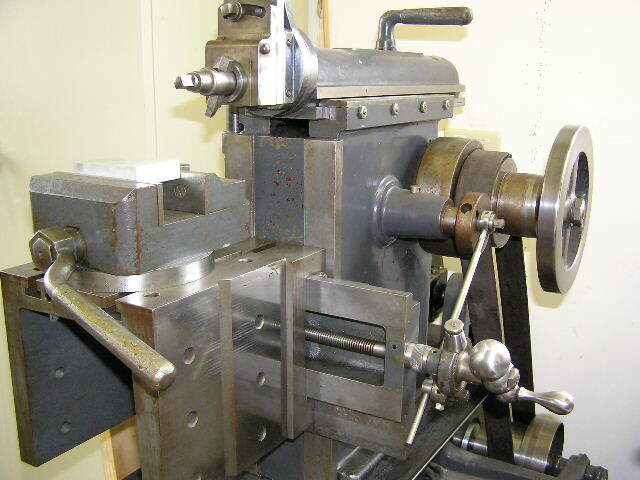 It is really a magnificent vice for a shaper and has a stout leadscrew. Rick Montague sent these photos of his Rhodes, serial number 1049. 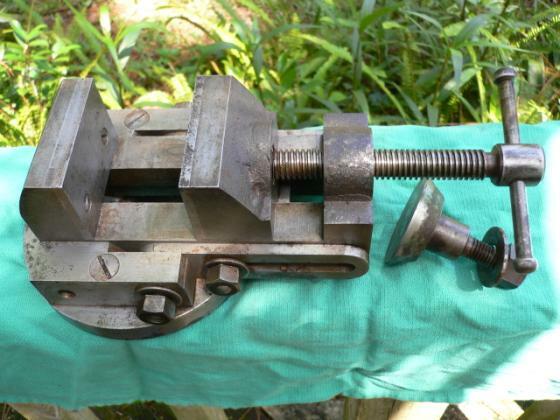 Notice the very different countershaft setup which he says looks like a factory-built part. 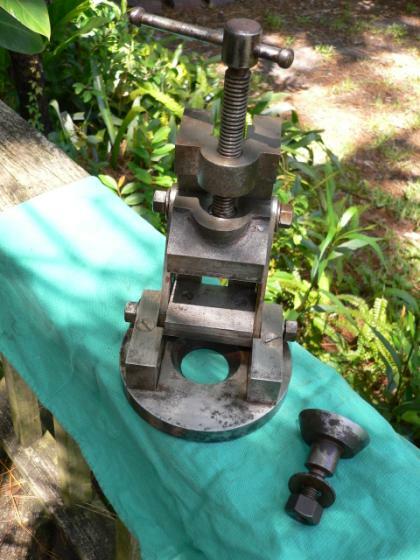 The vise is also quite different from the one on mine. Rick has a newer Rhodes with the number 2095. 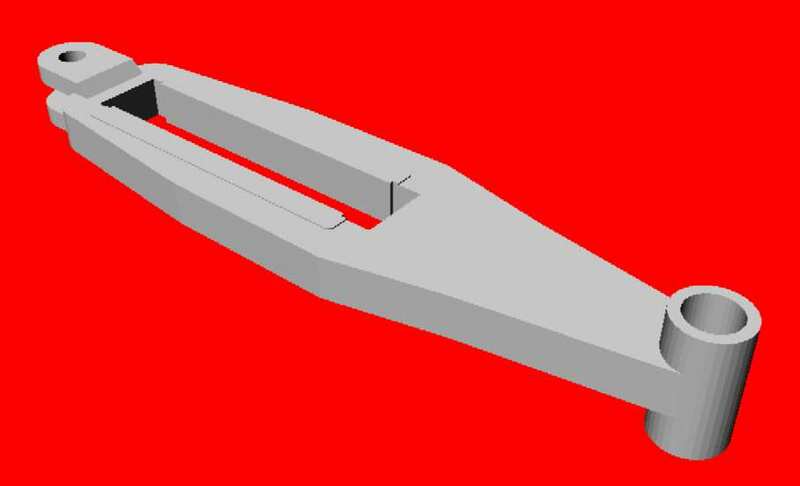 I did a model of the Rhodes table to get some practice with my Alibre CAD software, and here is the result. 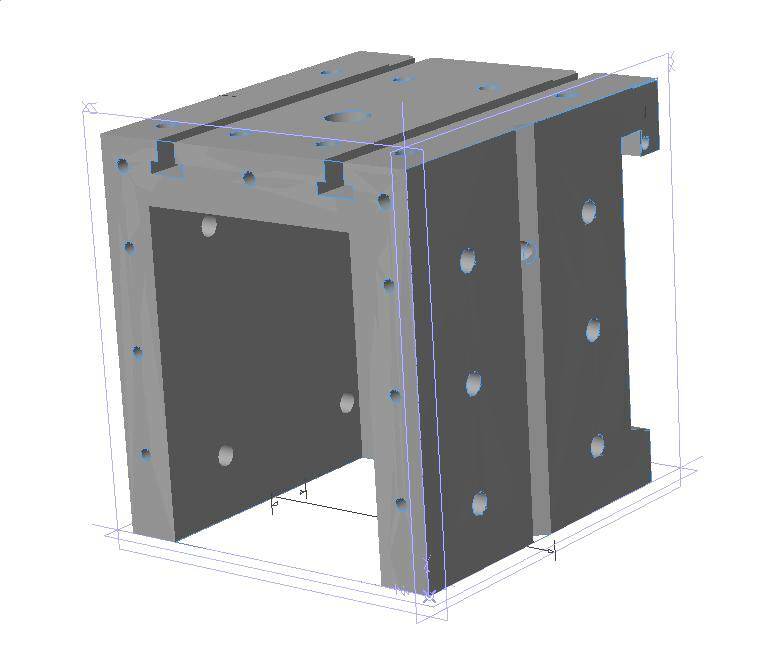 It is modeled as a machined part, and not a casting so there is no draft on the inside where things were left as cast. 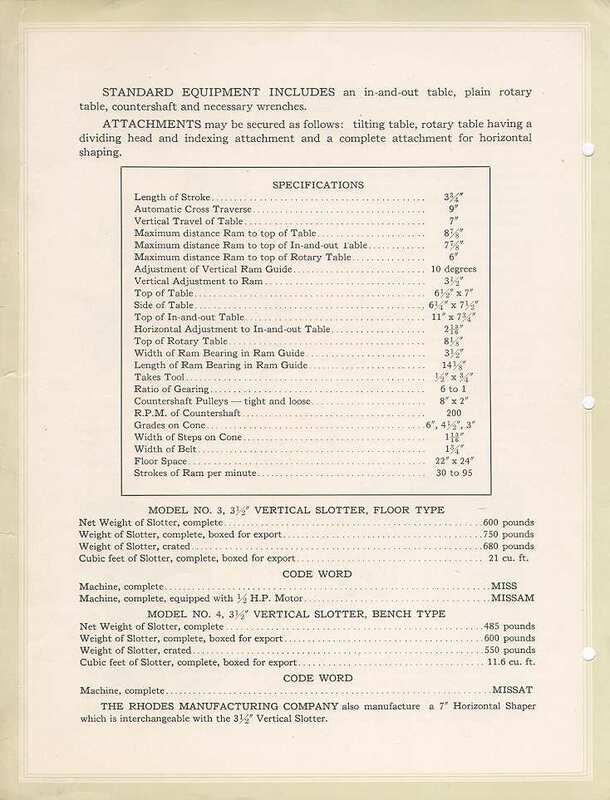 I also had to often refer to a list of decimal equivelants to see what the nearest faction of an inch was to the reading on my caliper, and I when there was something that looked really close I set the dimensions in the model to that fractional inch. 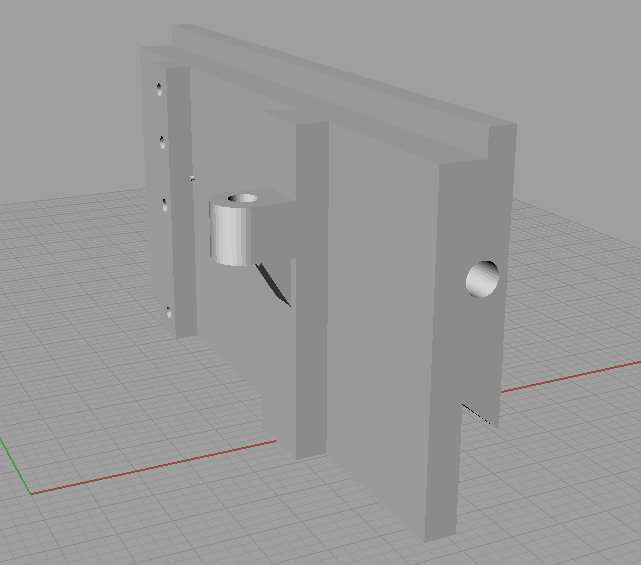 If anyone needs a dimensioned drawing to make their own, just drop me a note. 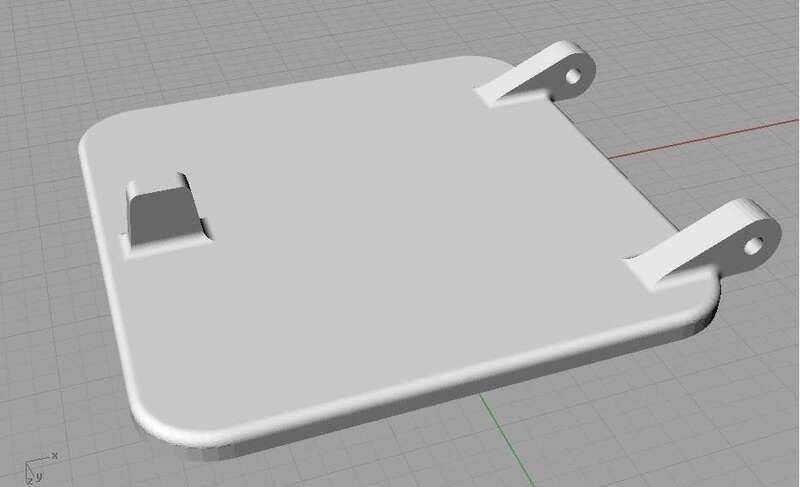 I'll keep on modeling parts as I get a chance. 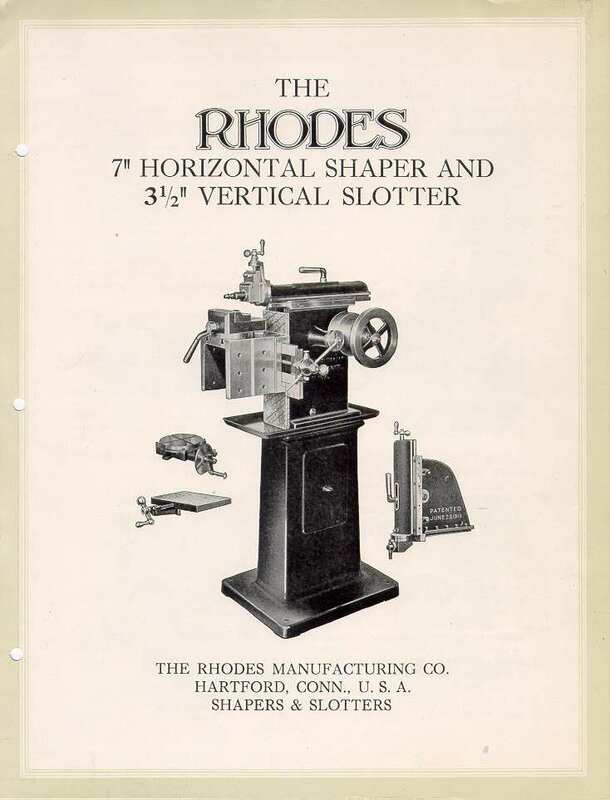 Along with the shaper I got an original 6 page brochure on the 8" shaper and 4" slotter. 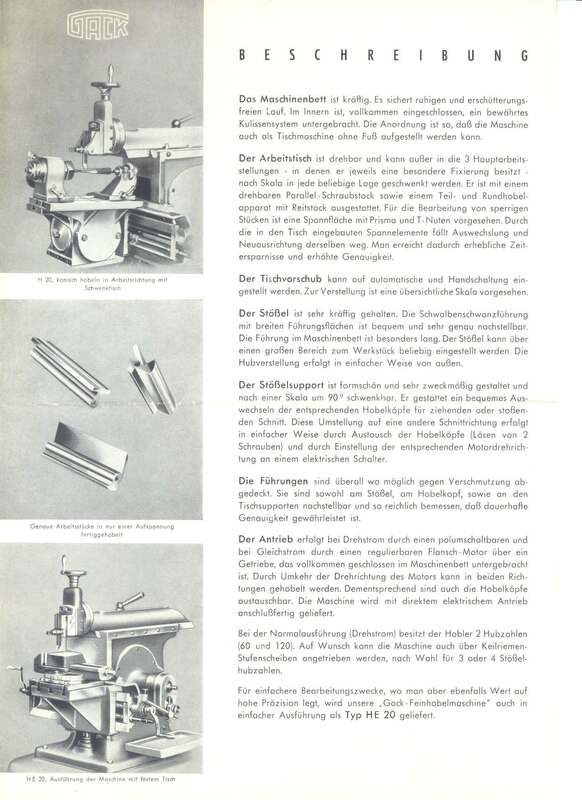 Here are some good-sized scans of the brochure. 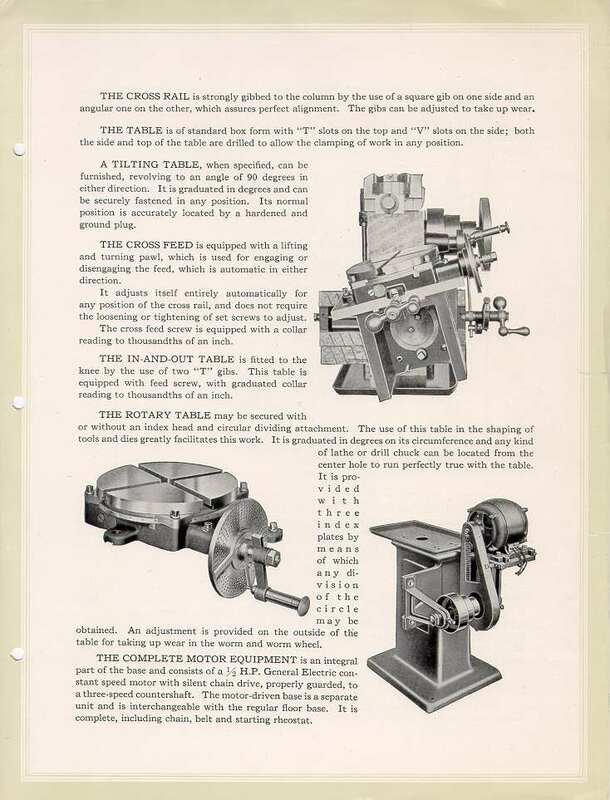 Here of scans of original 4 page brochures on the 7" shaper and 3.5" slotter and the shaper/slotter combo. I got lucky on eBay and scored all three together. 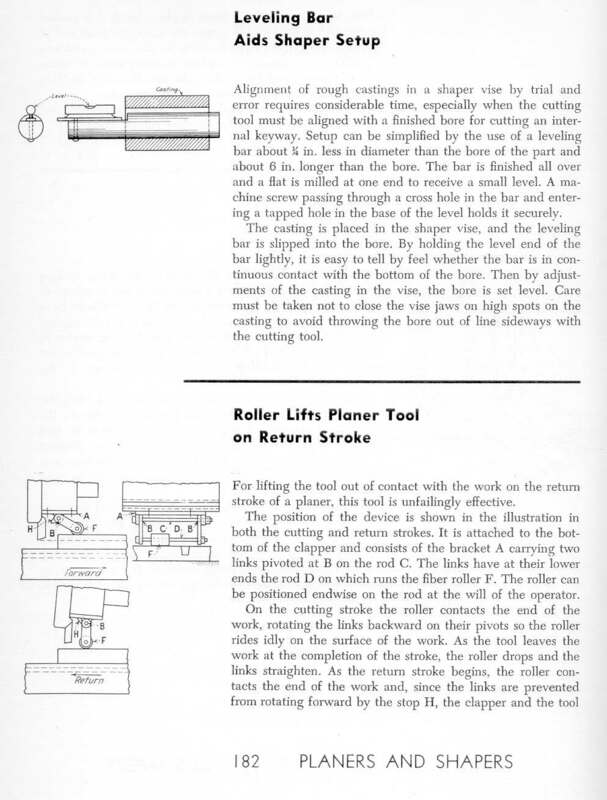 I recently picked up some technical books from the 1920s, and here's a zipped archive of scans of the shaper and slotter chapters from Shaper, Slotter and Boring Mill Work. The zip file is nearly 6 megabytes in size, but it seemed easier to do it this way than putting up 30 different smaller files.. 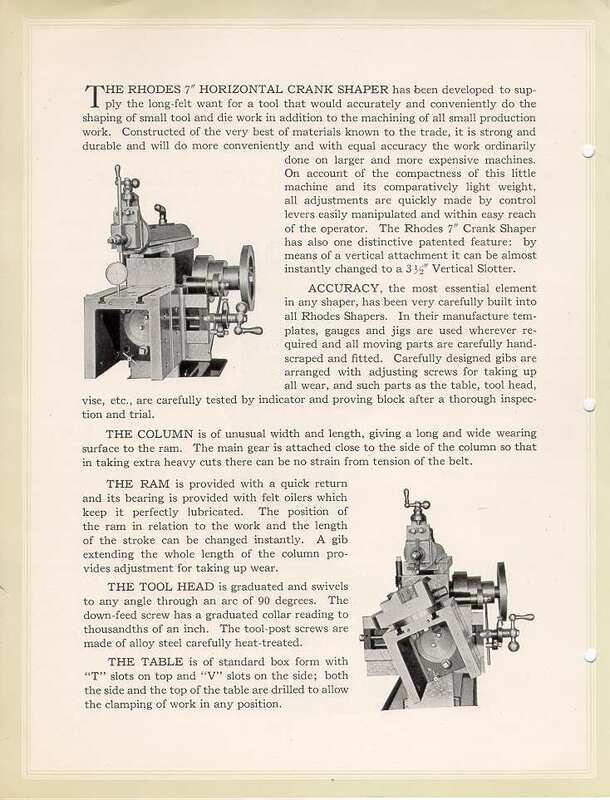 I have a copy of the first edition of "Practical Ideas for Machinists" edited by H. E. Linsley, at that time Associate Editor of "American Machinist" magazine and printed in 1950. 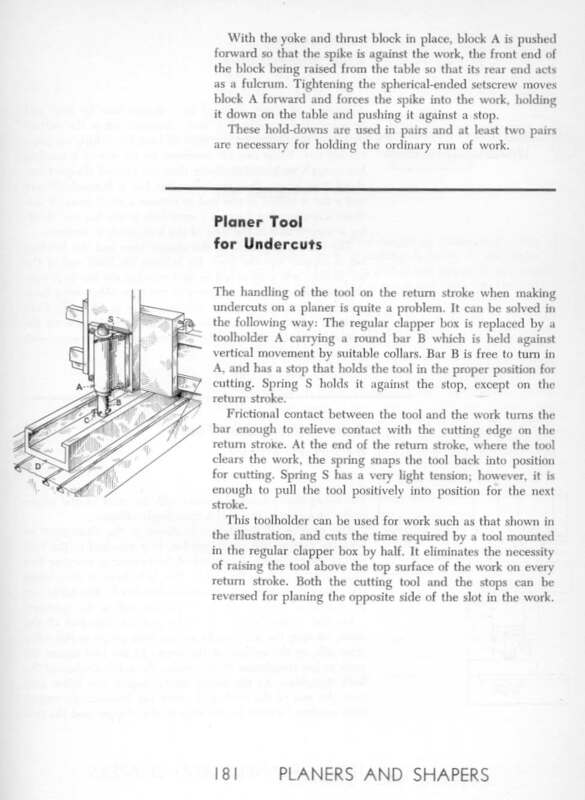 It contains tips that were included in the "Practical Ideas" column in the 1940s. 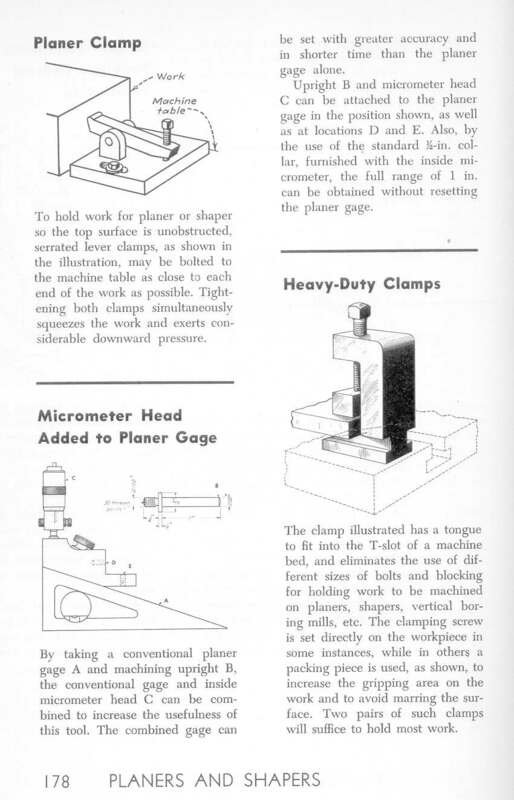 American Machinist magazine has given me permission to reproduce here the chapter dealing with tips for "Planers and Shapers". 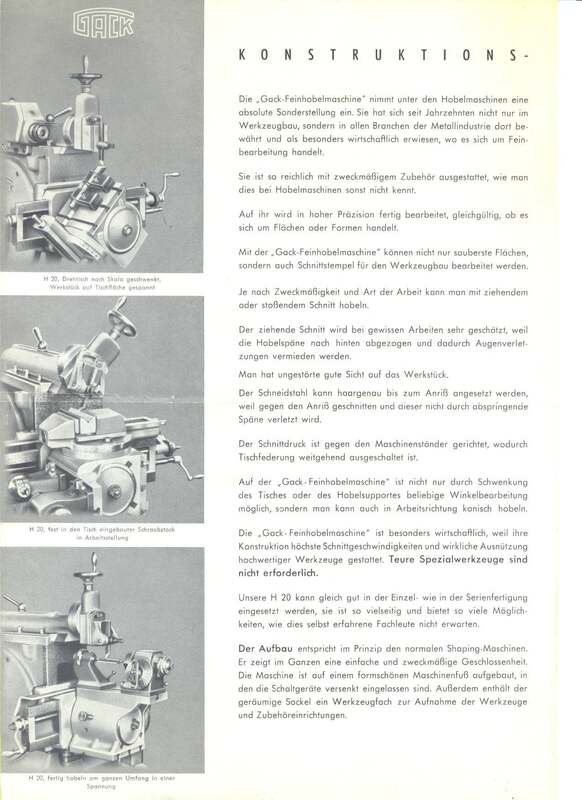 These are fairly large scans so the details of the drawings will be clear. 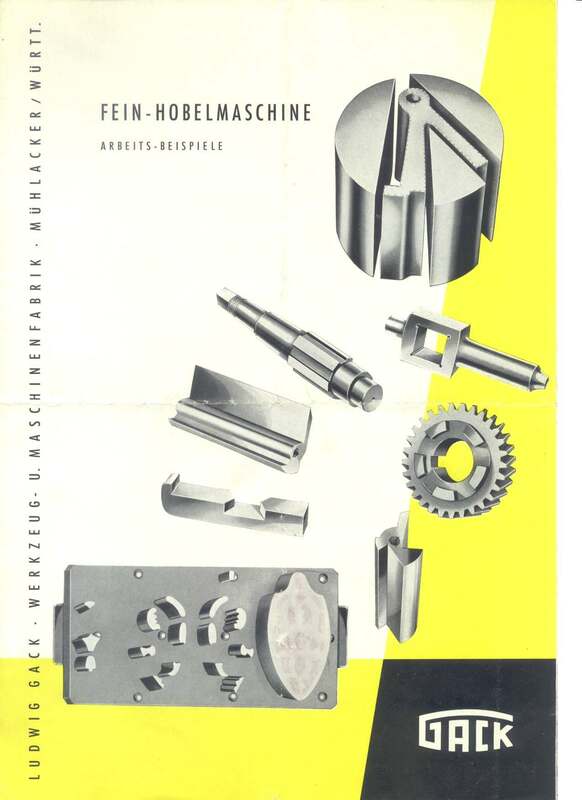 Please visit the American Machinist website. 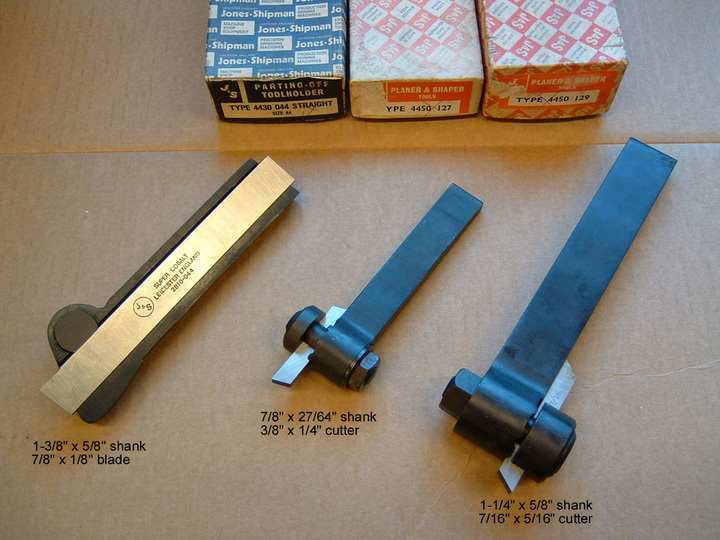 If you are wanting to communicate with a community of owners of (mostly smaller) shapers, the Yahoo Metal_Shapers group should be right up your alley. The first messages in the group archive are from late 2001, so there is a lot of information there. 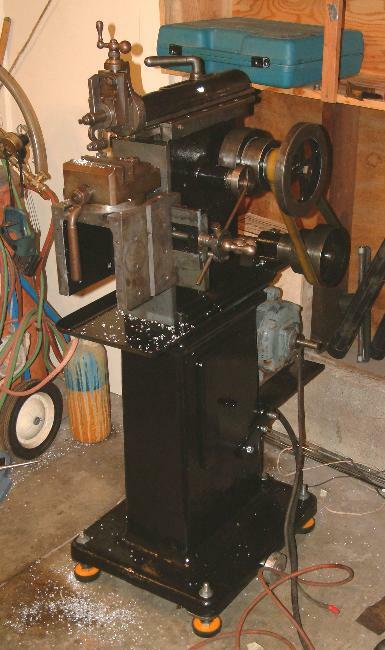 Jim King sent this photo of his 12" Sheldon . He could use some help identifying the year as he hasn't yet found a listing of serial numbers. 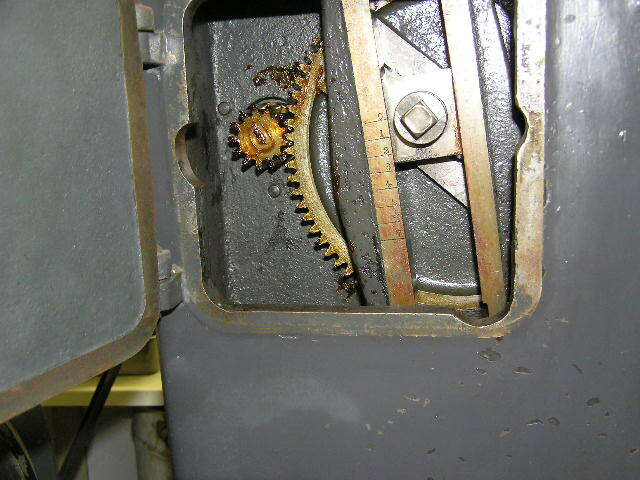 He notes that the machine has a variable speed drive. 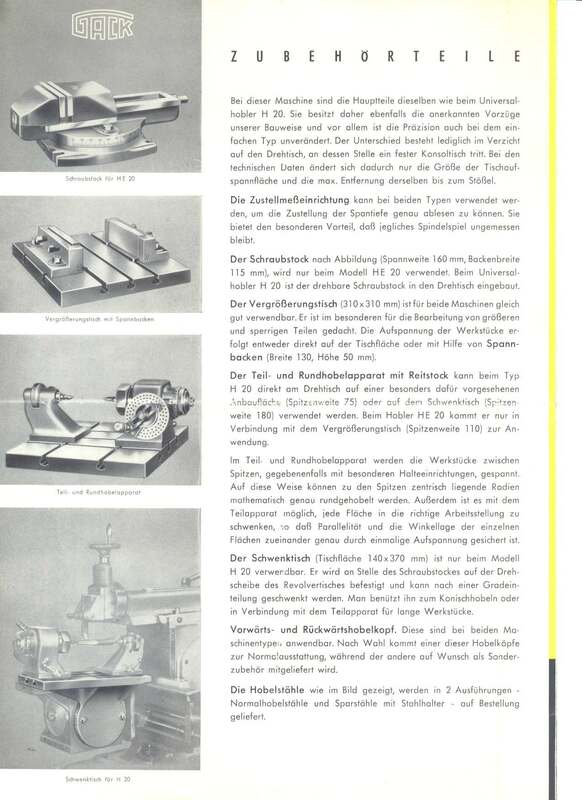 Benta in Germany sent me a scan of his Gack H20 sales brochure dating from the 1950s. He owns a 1956 H20. 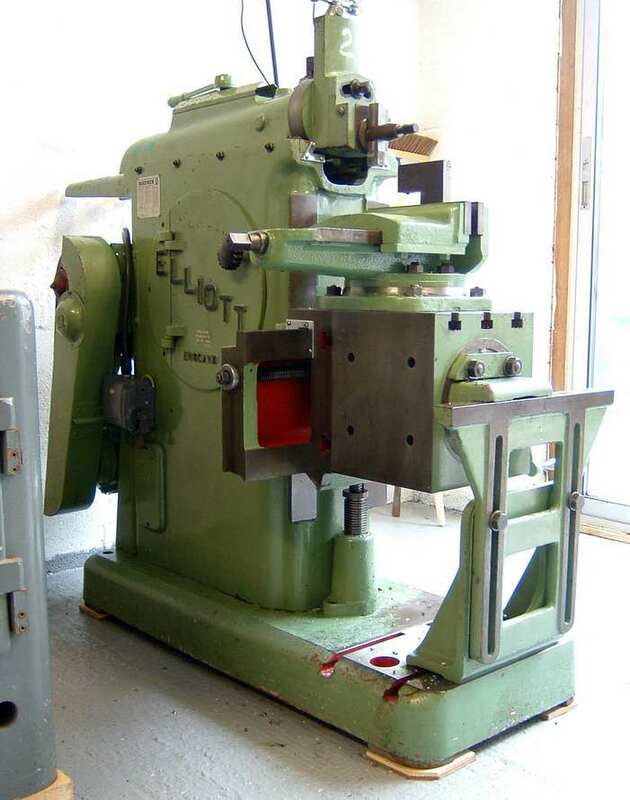 Brian in England supplied some nice photos of his Elliot 14M (14" stroke) shaper. 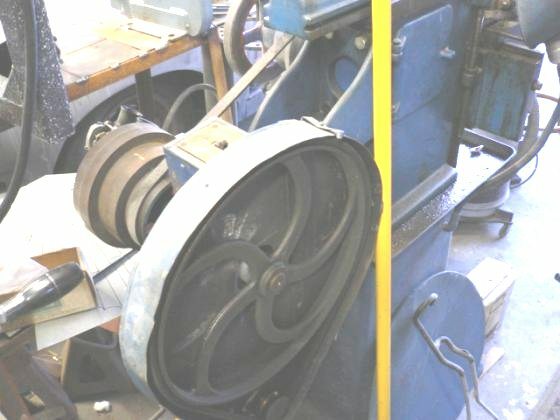 He told me "I won the machine on Ebay for the princely sum of �52.00 from the Fairbourne Steam Railway Company in Wales, a further �65.00 for delivery and it was at my door 3 days later. 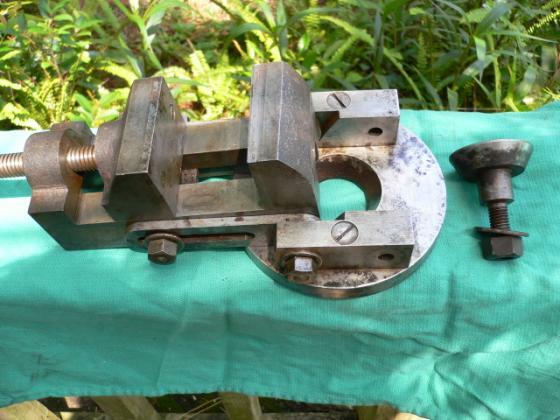 The machine was complete down to all the original handles, it was degreased & pressure washed then re-lubed & installed exactly as you see it in the pics, I doubt it had ever had more than a few hours use from new." 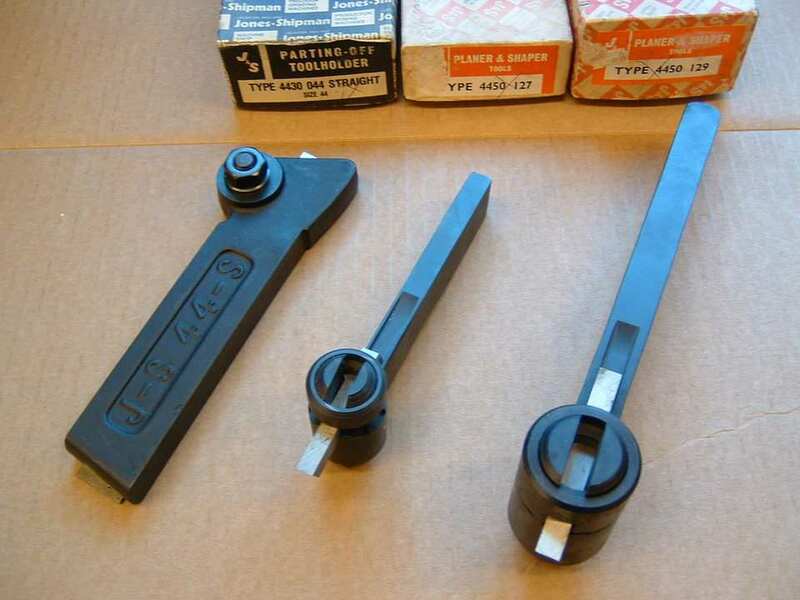 He also sent some photos of some shaper tools that he bought, along with the boxes they came in for reference. 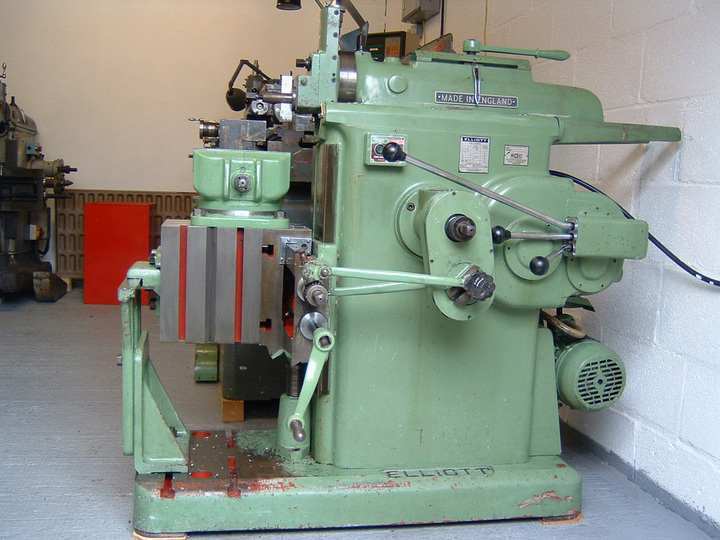 I found a photo of a Sanches Blanes shaper that was being offered for sale by a machinery dealer. 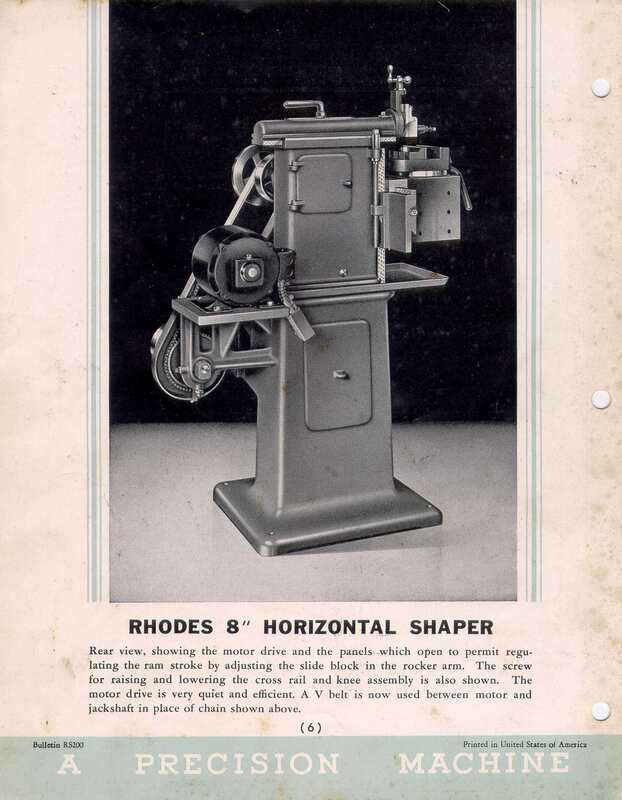 The only information shown was that is a 25 cm machine. 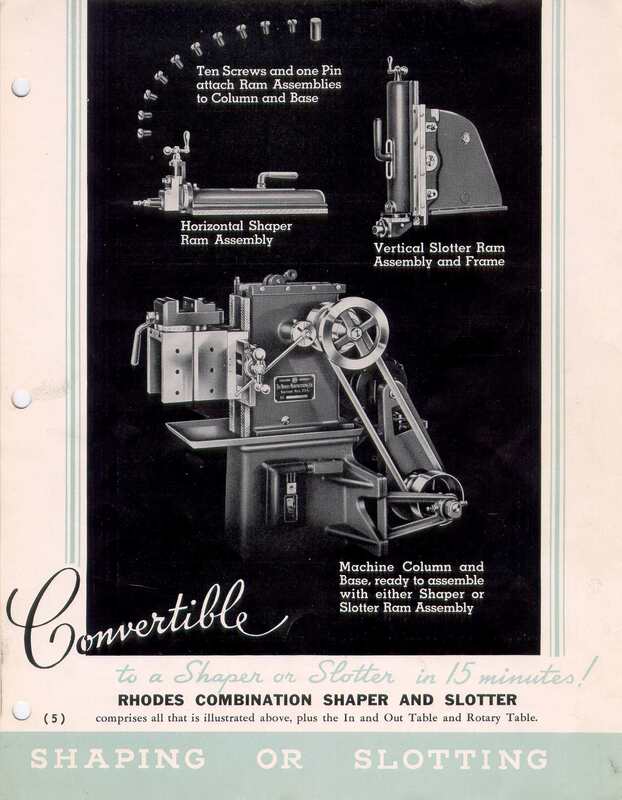 I was able to locate on another site that Sanches Blanes was a company in Brazil that made copies of South Bend lathes. I'm not familiar enough with the South Bend shapers to be able to tell if this is a copy of one or not. It has an interesting looking table on it. 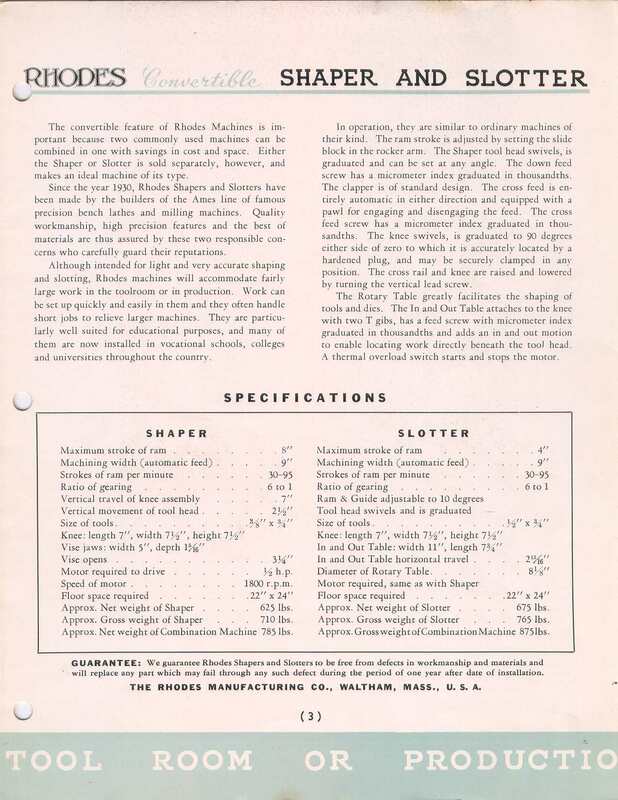 8" Logan shaper info and some photos of shaper work by Artful Bodger/Pete S??? 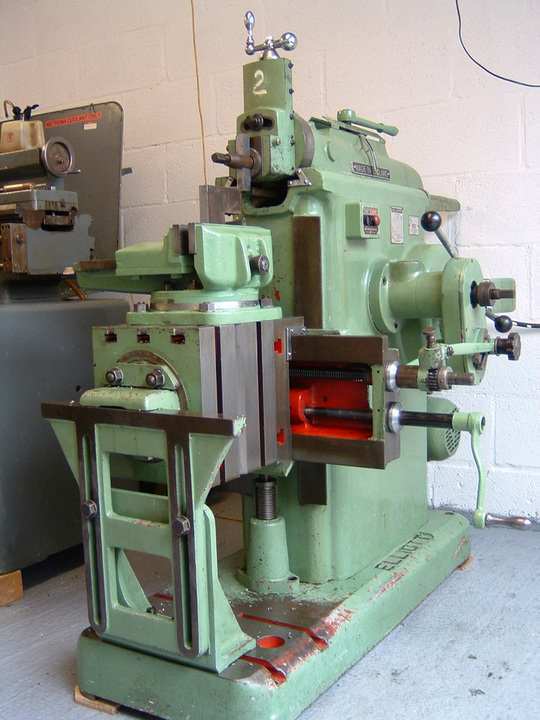 200mm stroke Ludwig Gack shaper found recently after being carefully stored when new and unused in 1965! 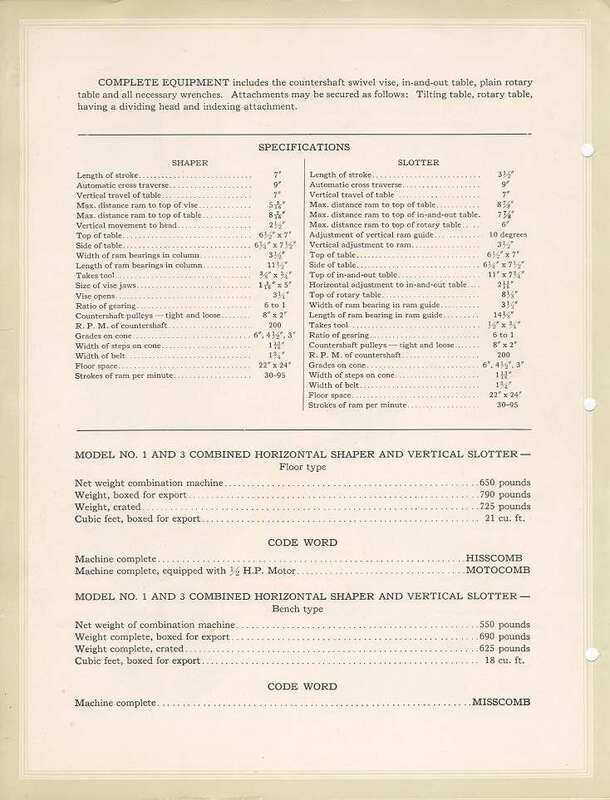 I've accumulated a number (about 20 megabytes) of manuals and similar documents that I've turned up in group files, file archives, via Google, or who knows? Since tracking things down can be a problem, especially when the site hosting them drops off the Internet, I'm going to load them to my website and list them here. 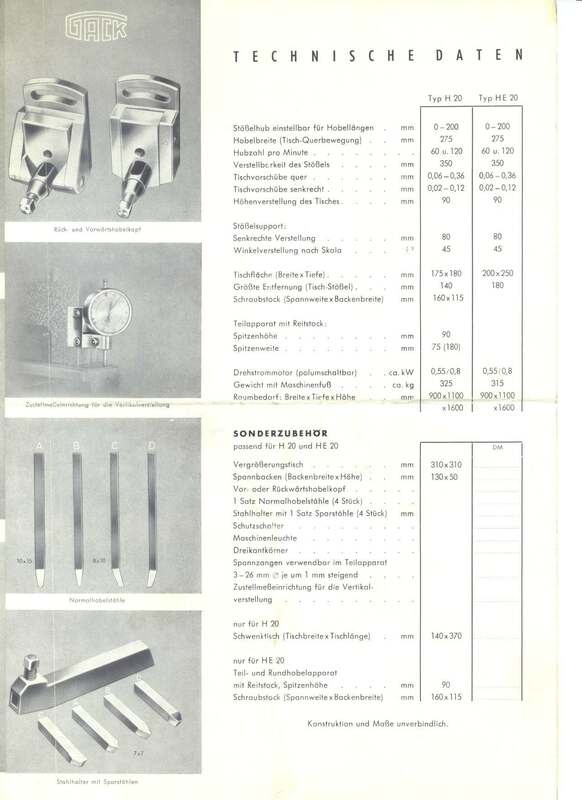 I think these are mostly old public domain documents that people have scanned and shared. As is my normal practice, if someone can identify something that they hold copyright on and they want it removed, I'll do so. If someone can say "hey, I'm the one who copied my rare bit of paper" I'll remove it if they want, or I'll add them as the source. My presumption is that if this stuff was put up on the Internet by someone, they intended to share it with people who had a need/interest in the information. I'll give credit where credit is due. 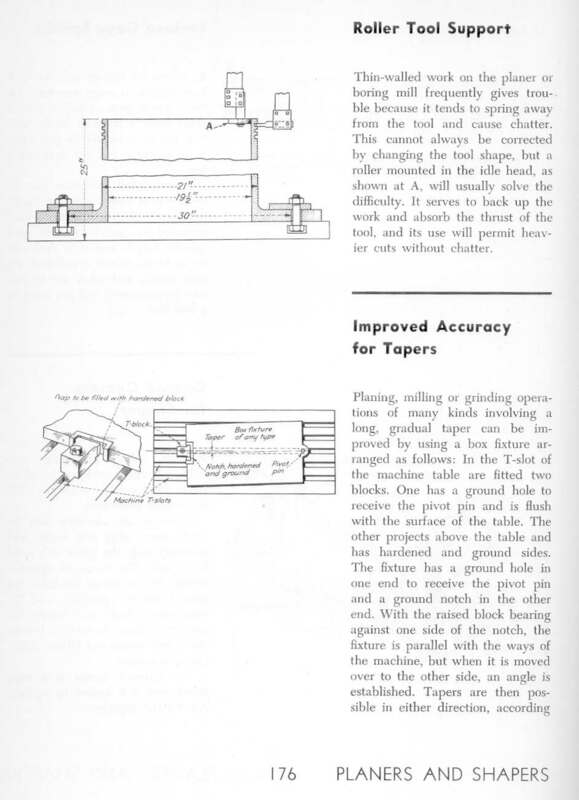 "Know Your Metal Shaper" 1954 Popular Mechanics article. It appears there are some shaper videos on YouTube. 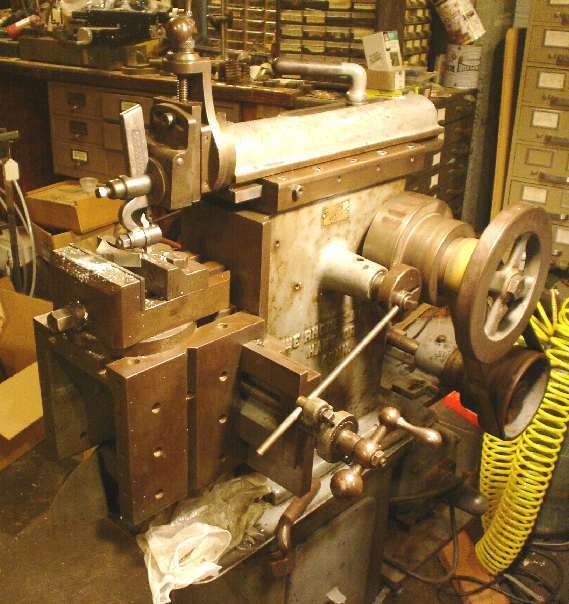 Here's one of a 10" Lewis shaper working away. 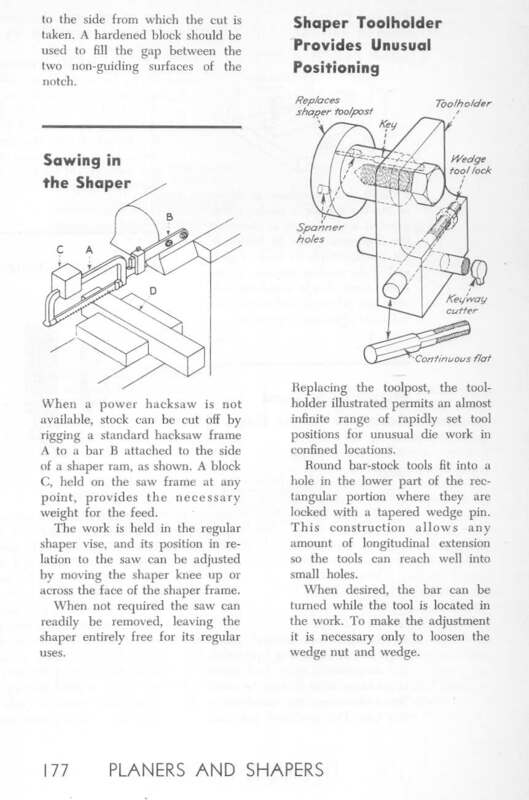 You'll see links to other related shaper videos there.